I am back to writing. But in a very slow way. I started this post over two weeks ago. And now January is almost over. I felt nostalgic. The last time I did this was 2012. And then social media happened. I got distracted. I didn’t do a retrospective of 2013 or 2014. So because of the lack of stories from 2015, I spent time and dug up photos and stories about the year that was. I’m including moments big and small, random and deliberate, work and personal, travel and home. That was the year I met a member of the British royal family and a Prime Minister. 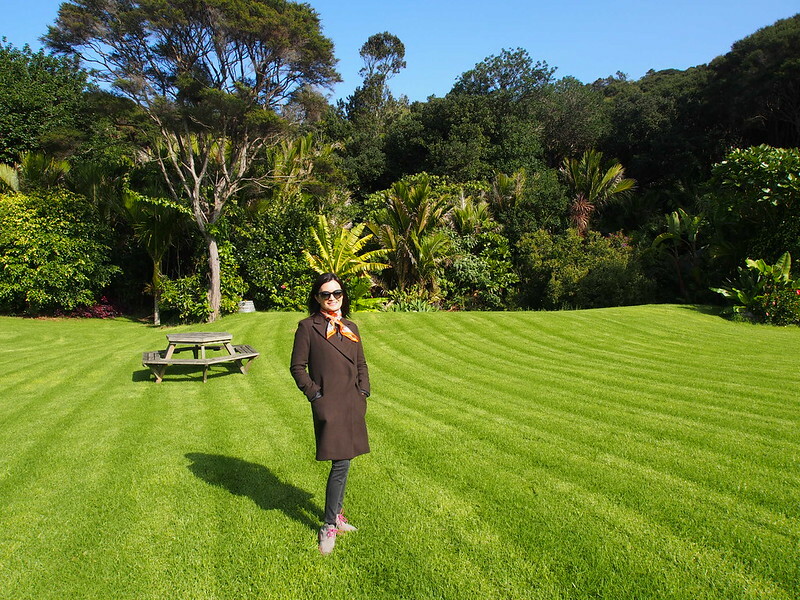 I went up the Himalayas and down under in New Zealand. 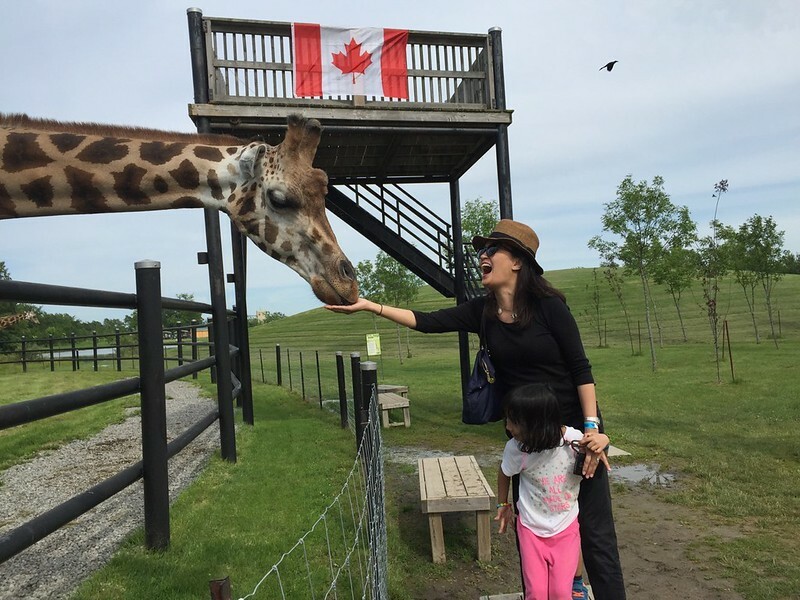 And we squeezed in a one month stay in Toronto. 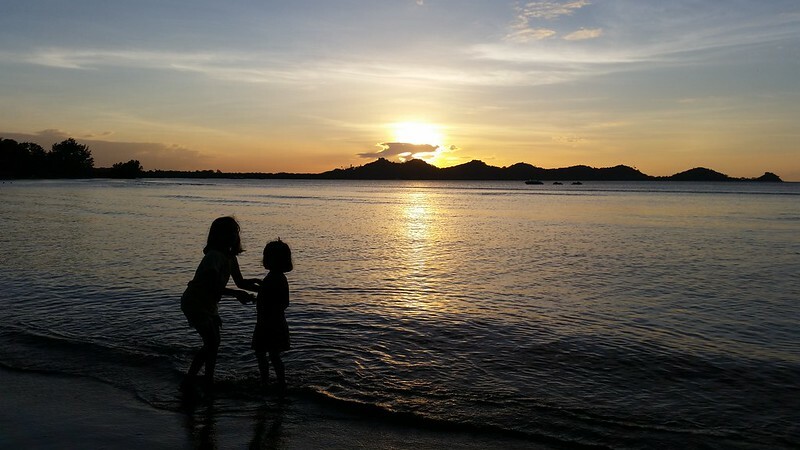 After writing, I realized that for a year that was totally unplanned, I had done so much. I put my trust in God completely. That was the year I just allowed Him to surprise me. And the blessings just came. Grateful. Here goes… this is going to be a long one. We started 2015 in our favourite beach. We’ve been coming here for ten years. 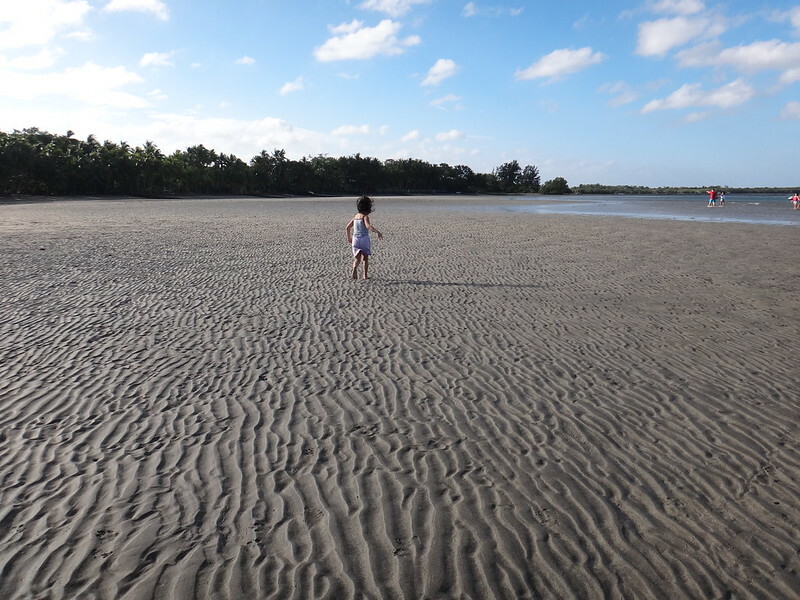 I remember when Stella was so tiny and we still had to carry her through the sand bar. Early morning walk while Patrick biked. During the second week of 2015, Pope Francis visited the Philippines. 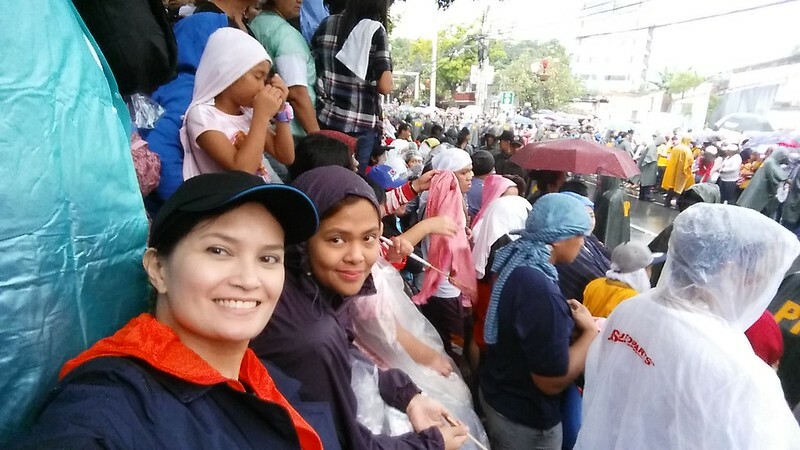 I sat in the rain for 5 hours with my cousins and waited to have a glimpse of Pope Francis. It was exhilarating. And experience I will never forget. 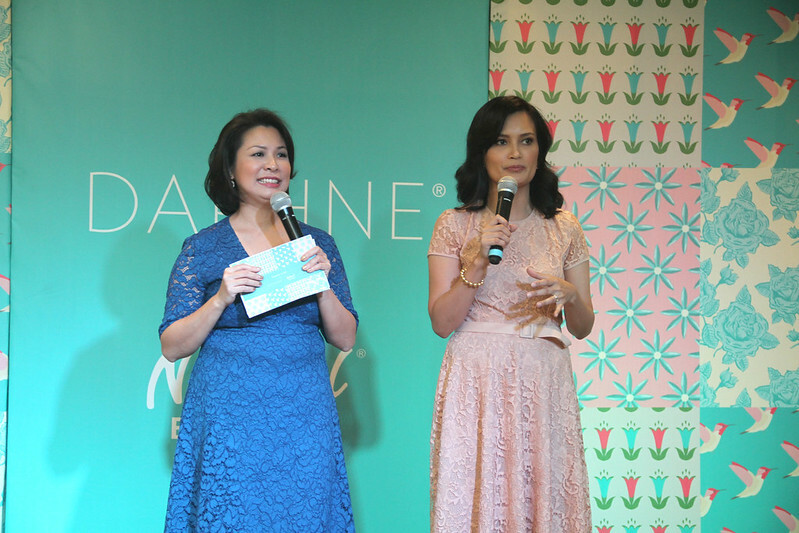 The Launch of DAPHNE & National Book Store stationery line happened on the third week of January. I am ever so grateful for the trust that Xandra Ramos Padilla has for my brand. This was a dream come true. Thank you National Book Store! These pouches sold out real fast. This is the daisy (Margarita) print. 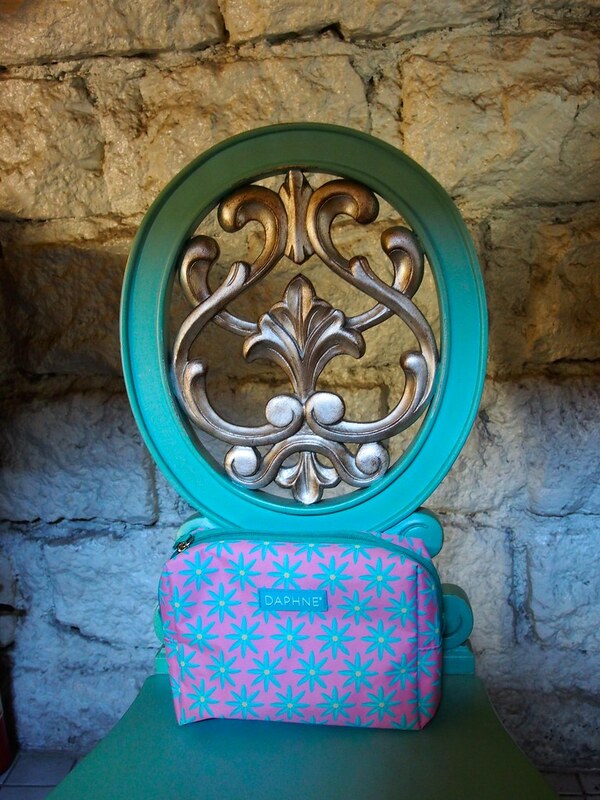 I just love seeing my products together… in my home. For the DAPHNE® & NBS products we took inspiration from my daughters’ names – the rose, the lily and the daisy. Isabel Gatuslao worked on the prints for me. We also had a hummingbird print that coincidently represents my dad – a helicopter pilot. 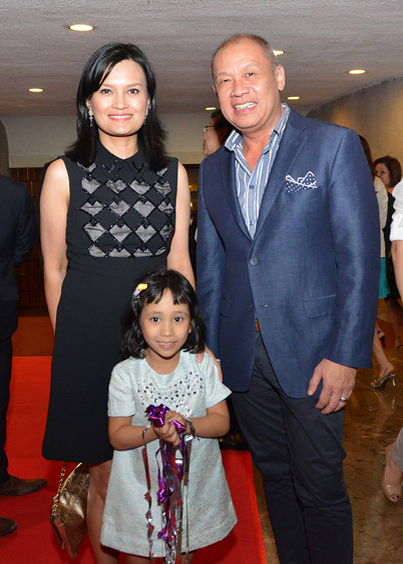 The launch was extra special because it was the first time I brought my daughters to any of my official events. And my parents were also in town then. January also gave us theatre. 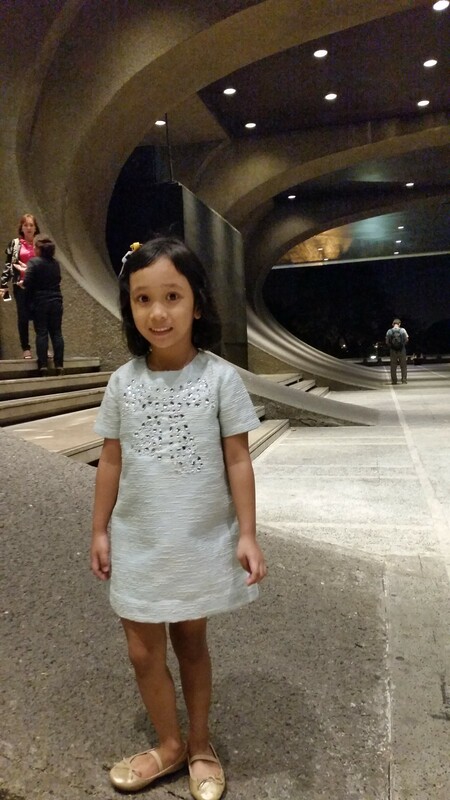 Stella and I were invited to watch Beauty and The Beast at the CCP by Globe Business. 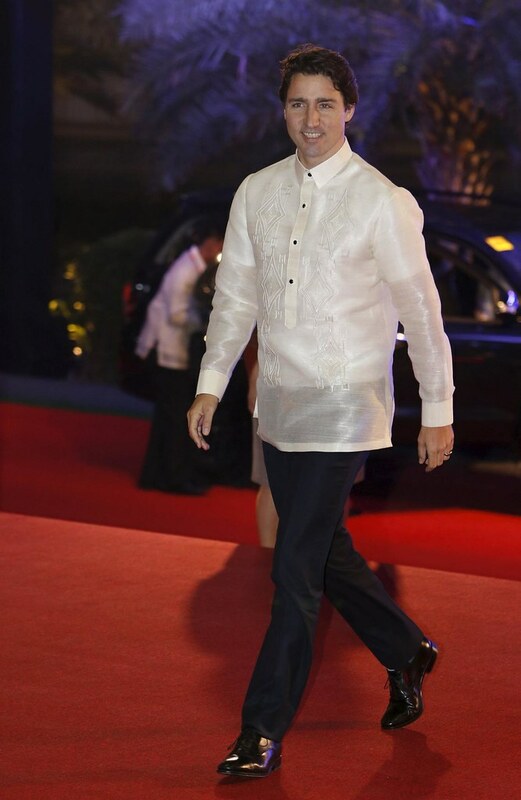 In photo is Globe’s President and CEO, Ernest Cu. 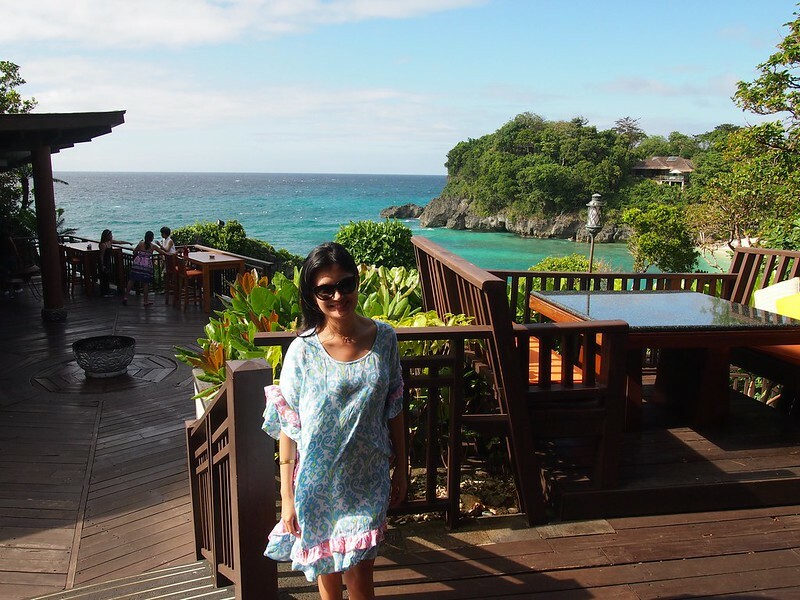 I got a couple of nights away at Shangrila Boracay with the MAC Cosmetics team. They introduced their Spring Summer 2015 collection. I swear, we were in Boracay for work. Not a bad way to do real work. Read my report here. 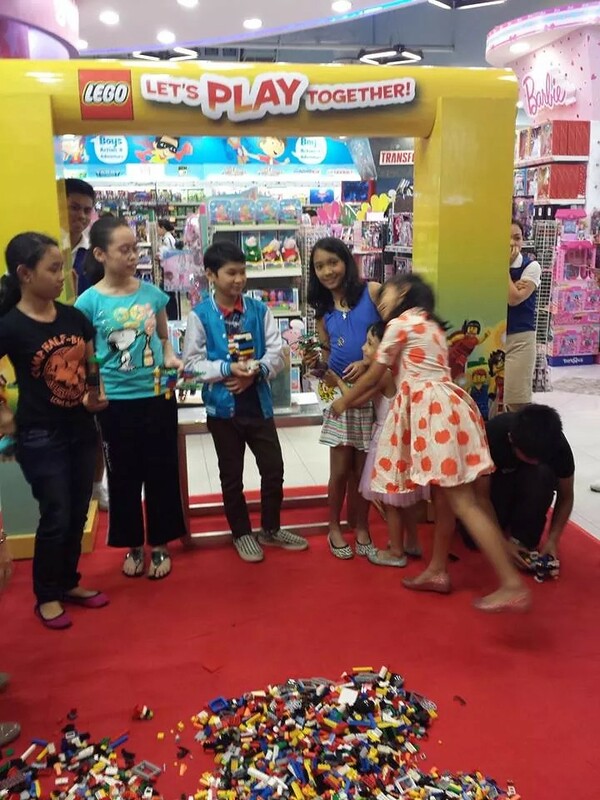 In February, Sophia joined a Lego competition in the mall. She was with my parents; we were not with her. She won first prize and came home with so many Lego sets! 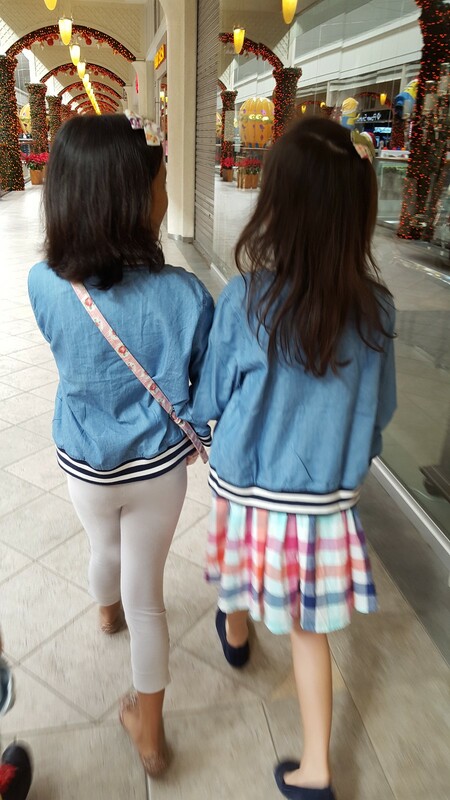 I’m doubly proud when the kids do things on their own initiative, with out mommy or daddy pushing them. Yay Sophia! 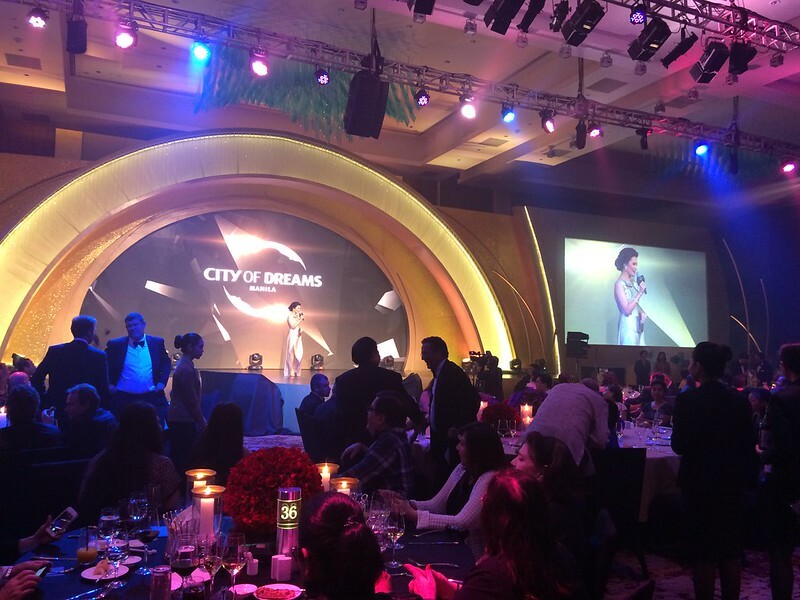 In the beginning of February, I hosted the official grand opening gala of the City of Dreams. I had been booked for this project half a year in ahead. And I was so amazed that it finally actually happened. 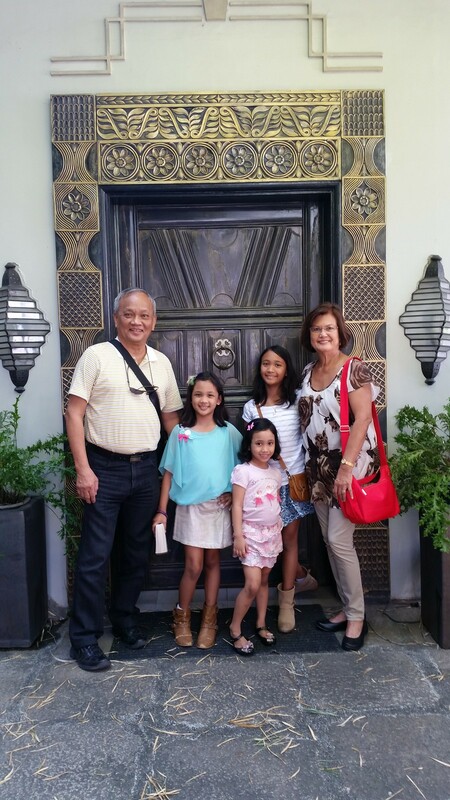 I had the honour of saying “The doors of City of Dreams Manila are now open!” I don’t have official photos though. Haha. Backstage at City of Dreams gala with one of my favourite makeup artists Ria Aquino. I shared the stage with Ne-Yo and Kelly Rowland. (I introduced them on stage). The very next day after City of Dreams launch, Patrick and I were on a plane to Bangkok to start our journey through Bhutan. Our one night in Bangkok was fun! I had never explored Bangkok before. I was always there for work. 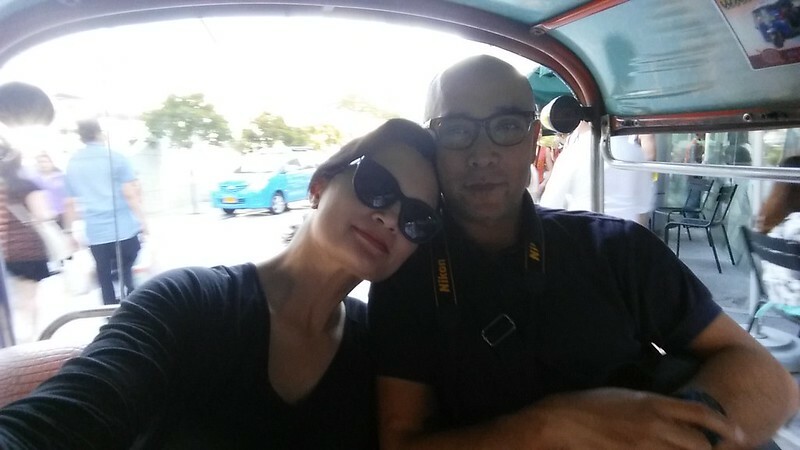 We did touristy things like ride the tuktuk and ferry boat. 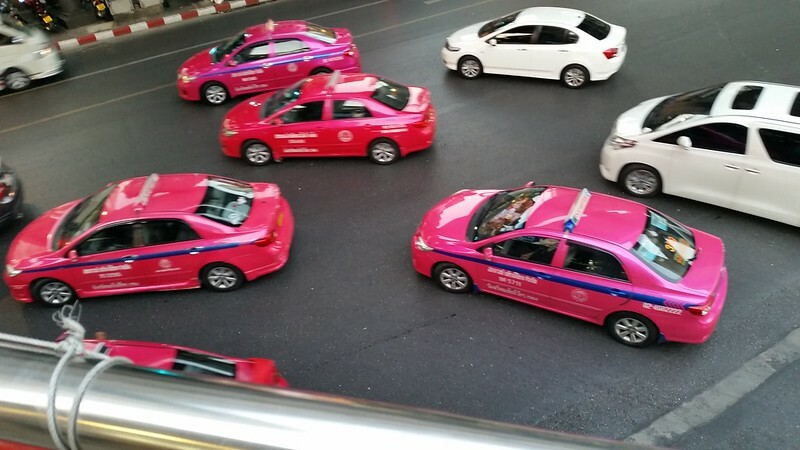 We went to Jim Thompson’s house, ate street food, took photos of pink taxis. 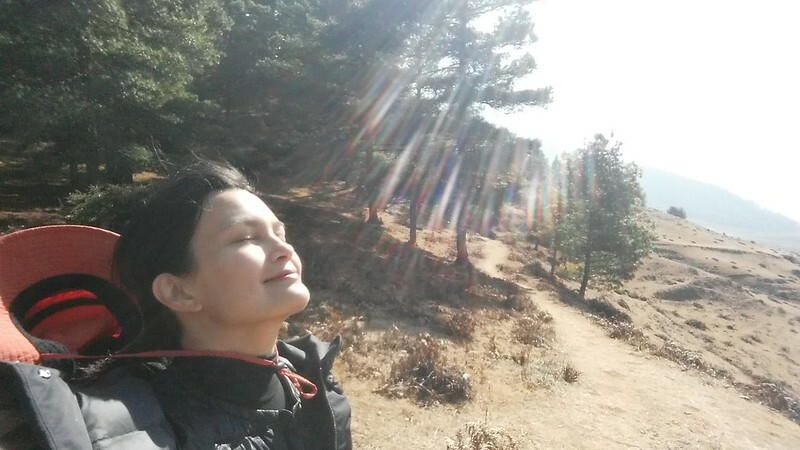 We just stayed for one night and flew to Bhutan the next morning. 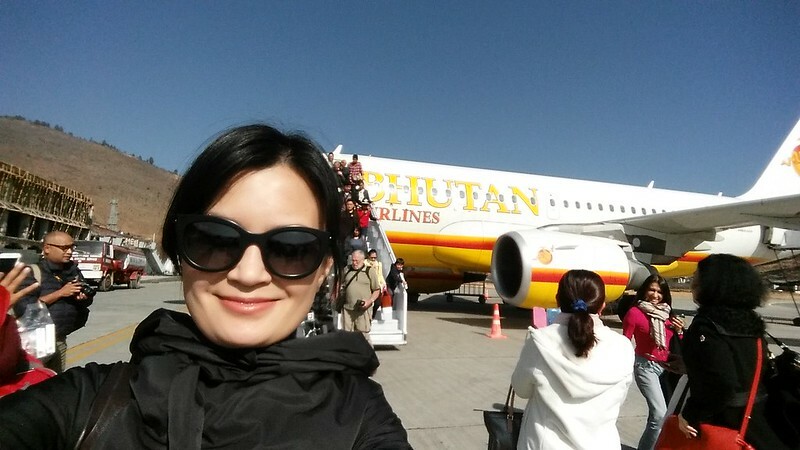 Touchdown Bhutan! It was the most exciting plane landing. If the view wasn’t spectacular, I would have flipped out. It was like a scene right out of Indiana Jones. Maneouvering through the Himalayan mountains with the view of Mt Everest out the window, and suddenly a short landing strip. 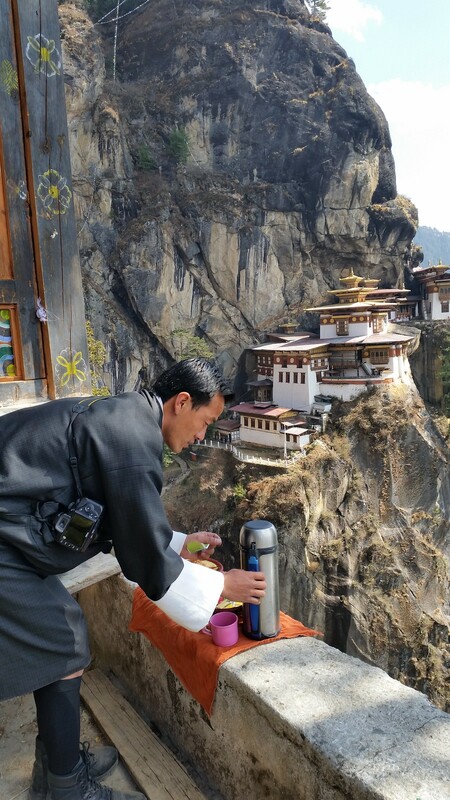 Watch one of my Bhutan videos. 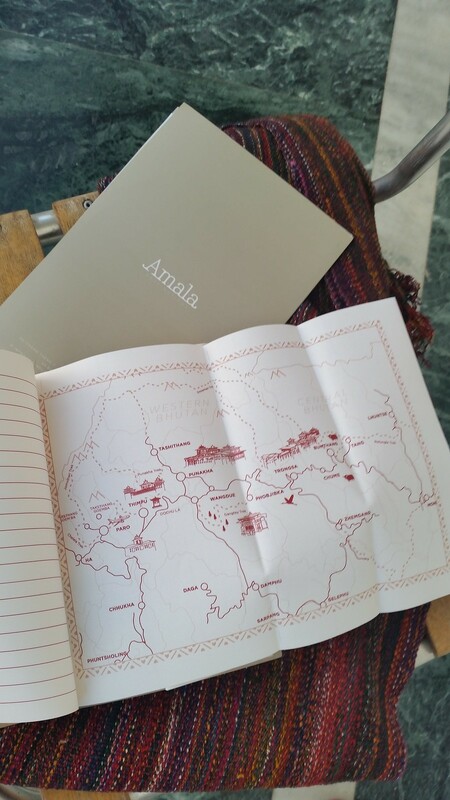 Our journey through Bhutan was curated by Amala Destinations. 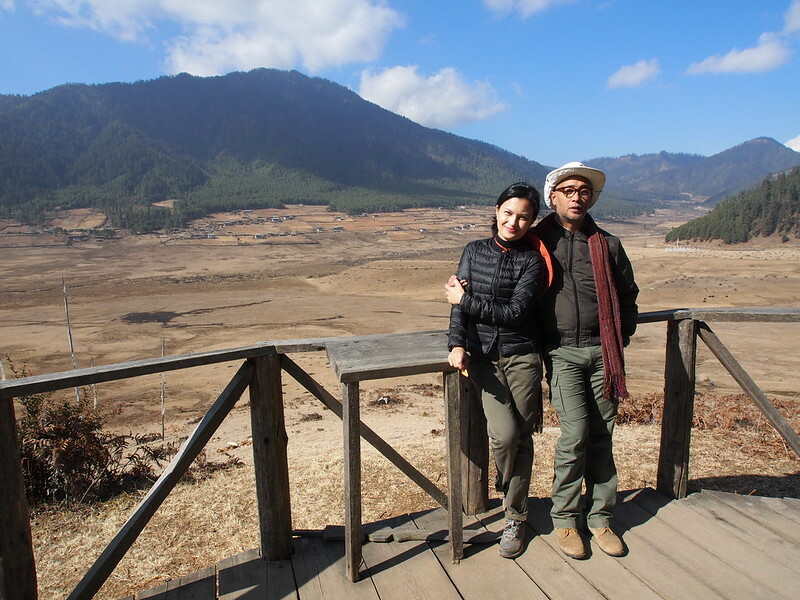 We spent 8 days traveling from Paro to Thimphu to Punakha to Phobjikha and back to Paro. It was one of our most beautiful and most special trips. This was the one of our first stops after landing from the airport of Paro, Bhutan. 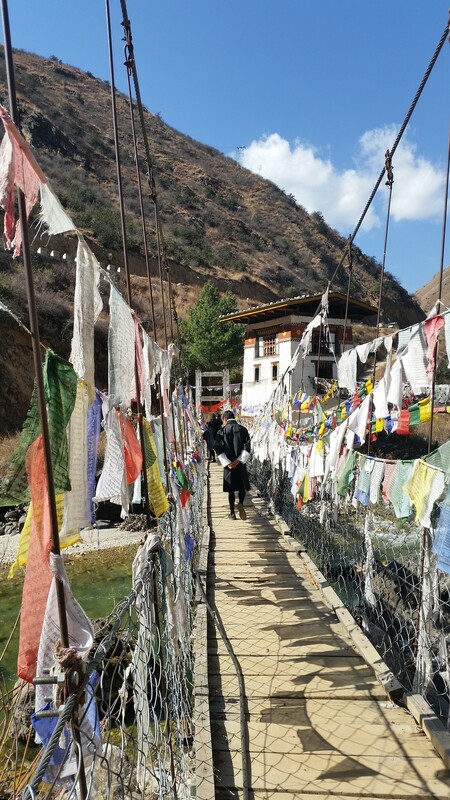 On our way to Punakha Dzong with some visiting monks. I knew they were visitors because Bhutanese monks wear red. British Vogue was there the same time we were. They were shooting Karen Elson. Totally random, saw a family of yak herders on our way to Gangtey (Phobjikha). 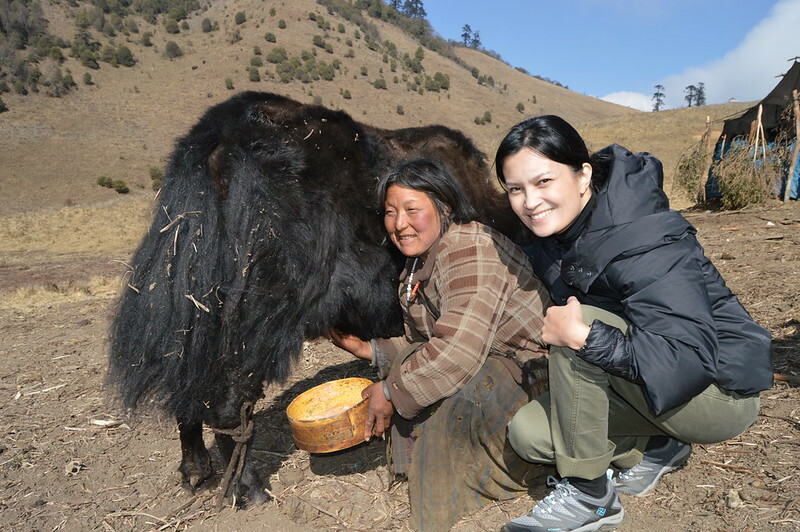 We stopped the car and walked down to where the farmer was milking a yak. She let me try. It was very… interesting! Haha. 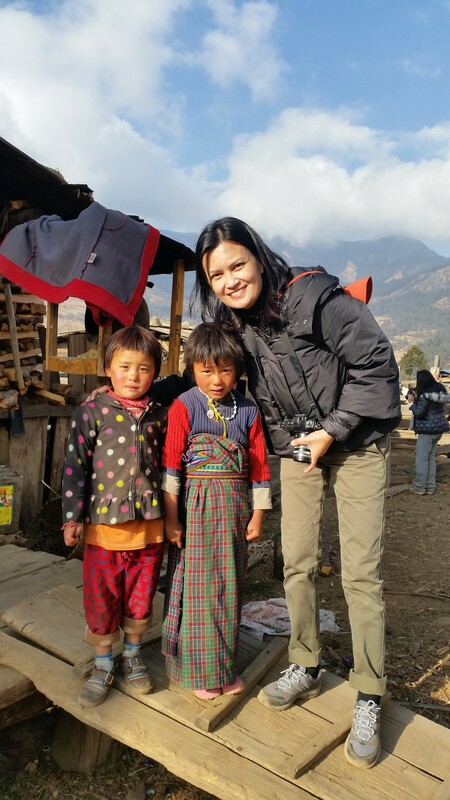 The beautiful children of Bhutan. 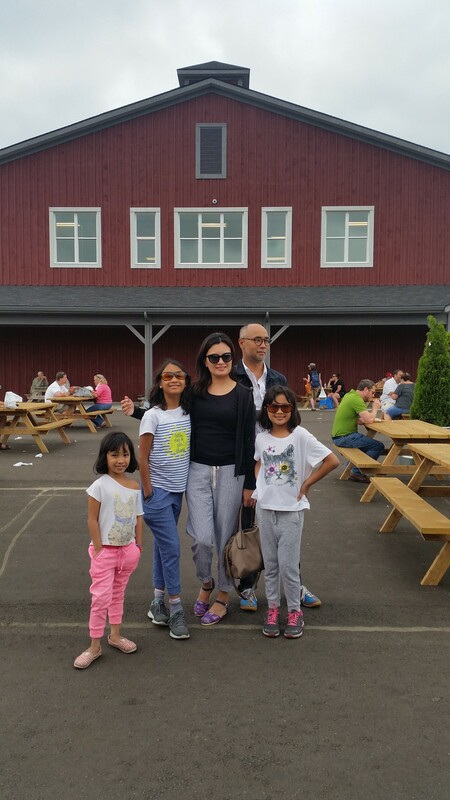 Read about our trip to the Kingdom of Happiness in this blog. I remember this moment. After our trek through Phobjikha valley. The air was so clean and fresh. I was so grateful. A favourite in Bhutan, Gangtey Goenpa Lodge. 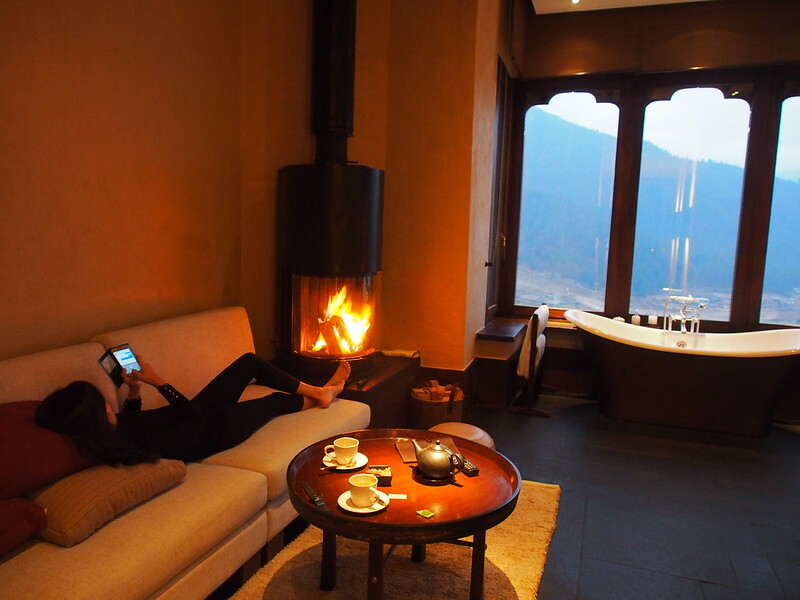 Read about our different hotels in Bhutan here. Our trek through Phobjikha Valley. The last highlight of our 8-day trip (every day was a highlight) was going up to Tiger’s Nest. Our guide Mani from Amala Destinations prepared some tea and crackers for us. Lovely touch. 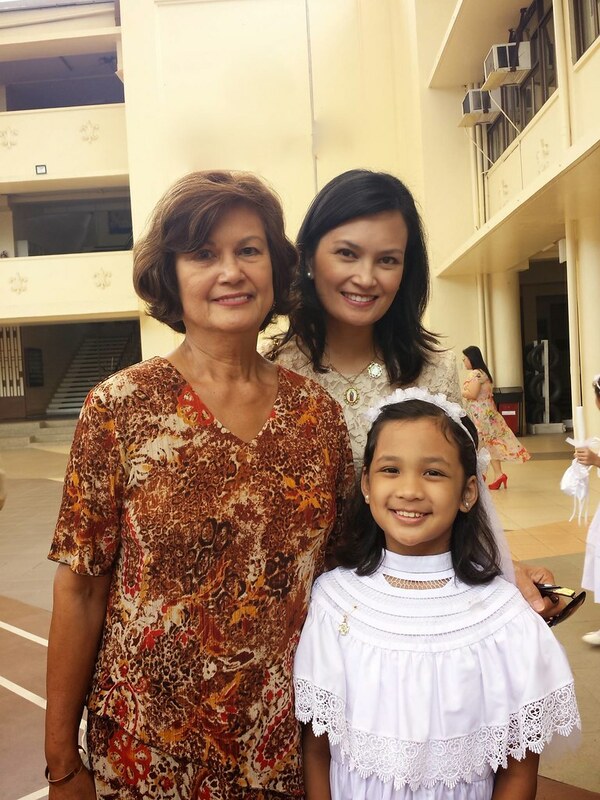 When we got back to Manila, we celebrated Lily’s First Holy communion. My mom and I chaperoned Stella at her kindergarten class’ field trip. 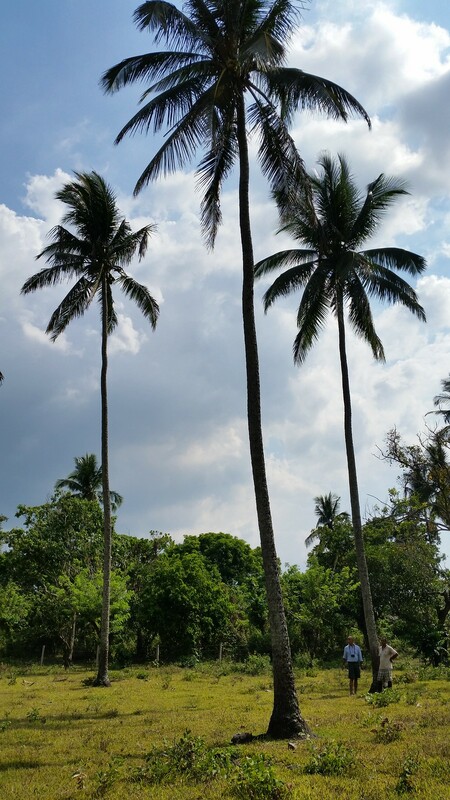 Who knew that there was a very green park in Pasig? It was pretty impressive. There was a small train, lots of trees, some animals (not a full-blown zoo), a butterfly shed and lots of tree seedlings with labels! 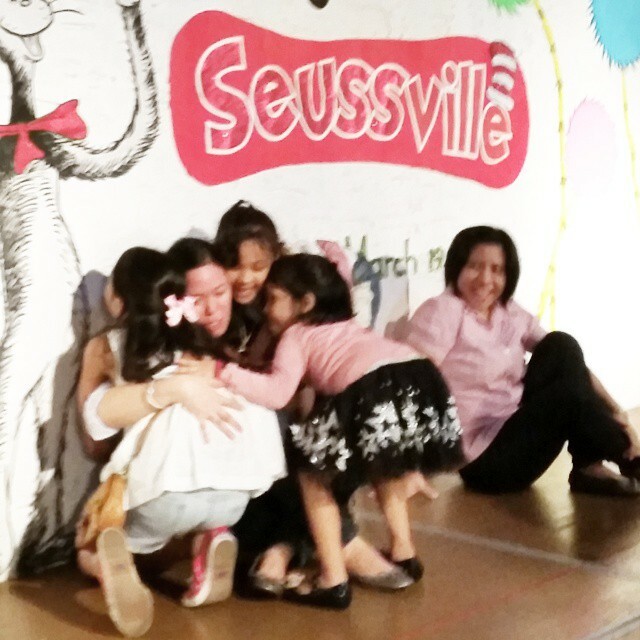 I am so grateful that I get to do this… be a school mom. The travel special I filmed in Barcelona in December 2014 aired on the Lifestyle Network. 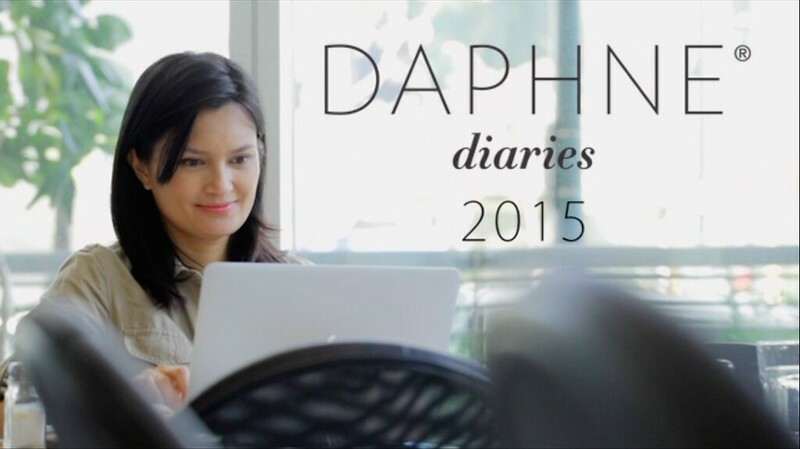 We called it DAPHNE Diaries. 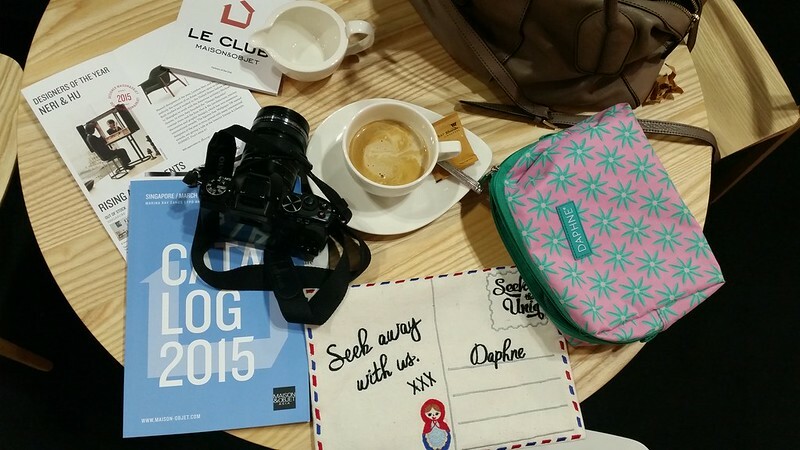 Click here to see the DAPHNE DIARIES, Wander in Barcelona, that aired in Lifestyle Network. Here is the DAPHNE DIARIES, Feast in Barcelona. I know this is ridiculous, but this is my only photo at the event. Cameras were not allowed except for official photographers. Haha, here’s proof. 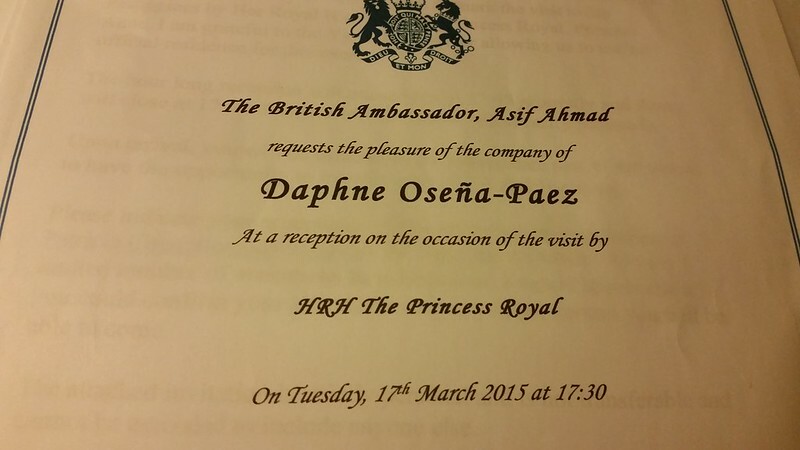 I was presented to Her Royal Highness. I curtsied (finally got to use my curtsy knowledge from years in Pi Beta Phi). Shook her gloved hand. Only spoke when spoken to. She asked me how long I have been living in the Philippines. She asked me about my UNICEF advocacy. She was in the Philippines to support Save the Children. There is no photo of us talking to each other. Here you see a bit of my face behind HRH’s back. The Canadian Embassy invited me to once again support their Study in Canada program. If you are considering sending your child to university abroad, you may want to check out Canadian schools. As of last checking, my alma mater, University of Toronto, ranked #17 globally. January to March was so nice because my parents were with us. It is so nice for my kids to have their grandparents around. And we are so grateful that they are now snowbirds (Snowbirds are retired people who avoid the snow and the cold and migrate to the south during wither. In their case, they go east then south to be with us.) I am truly so grateful that my folks are doing so well. Thank you, God. 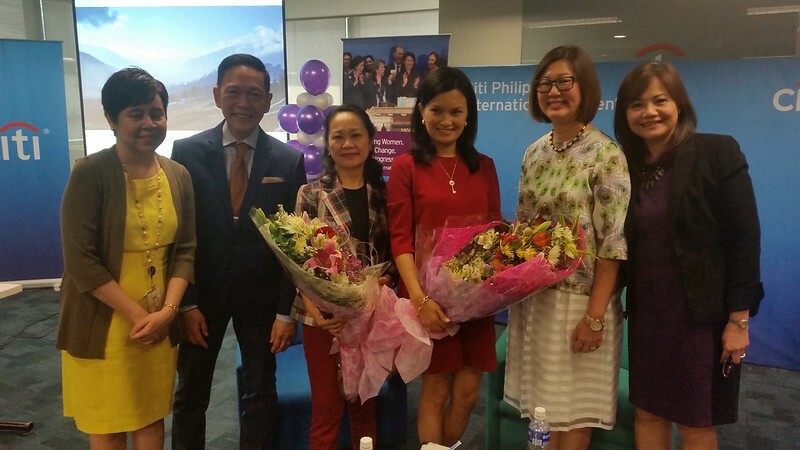 Also in March, I had the honour of speaking at Citibank for Women’s Month. 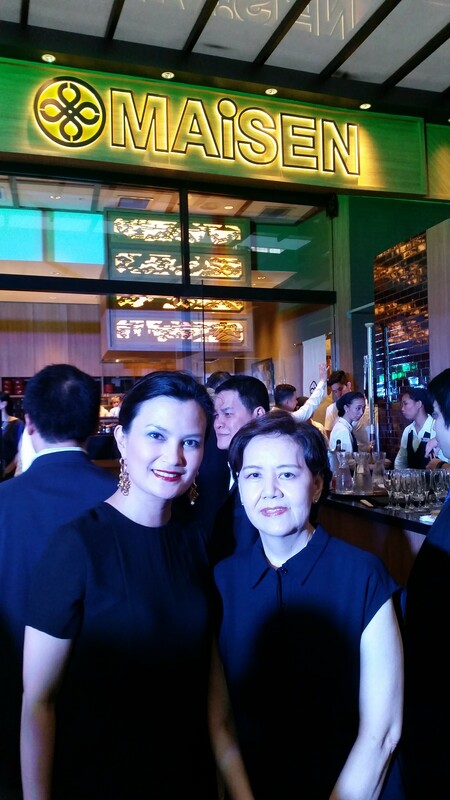 Thank you Bea Teh for inviting me. 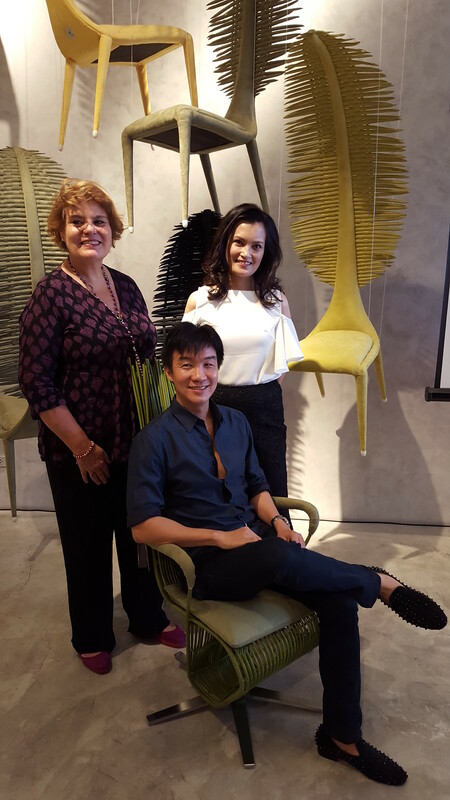 Immediately after my Citibank talk, the same day, I flew to Singapore to attend Maison et Objet Asia. 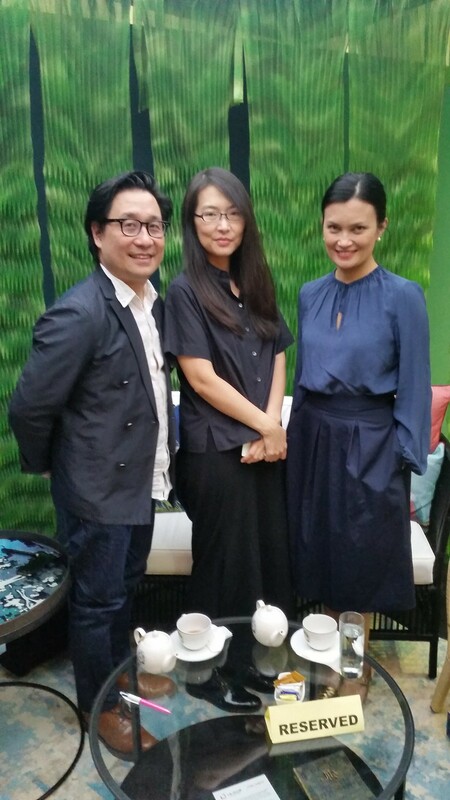 At Maison et Objet Asia, I interviewed Designer of the Year Neri+Hu – husband and wife team Lyndon Neri and Rosanna Hu. 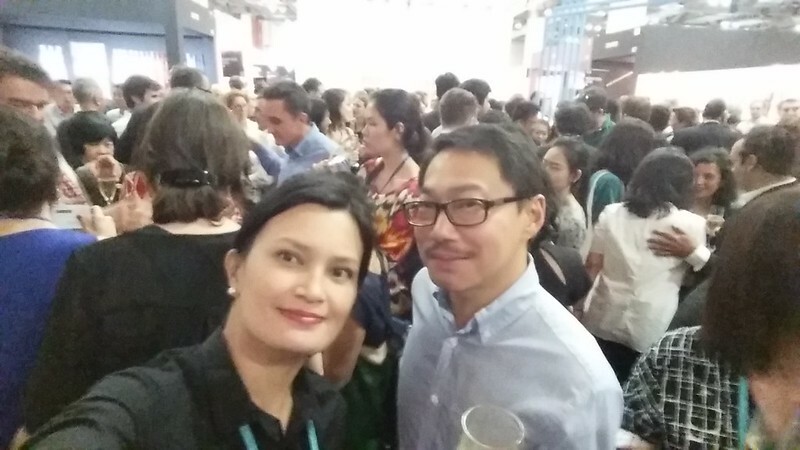 I had met Lyndon previously at the Cebu Chamber of Commerce’s Design Talks. Lyndon is Chinese Filipino. 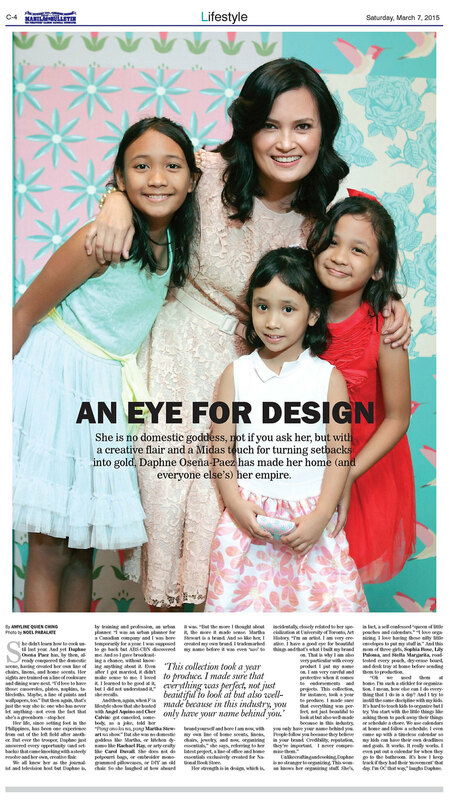 Read my interview with Neri+Hu here. 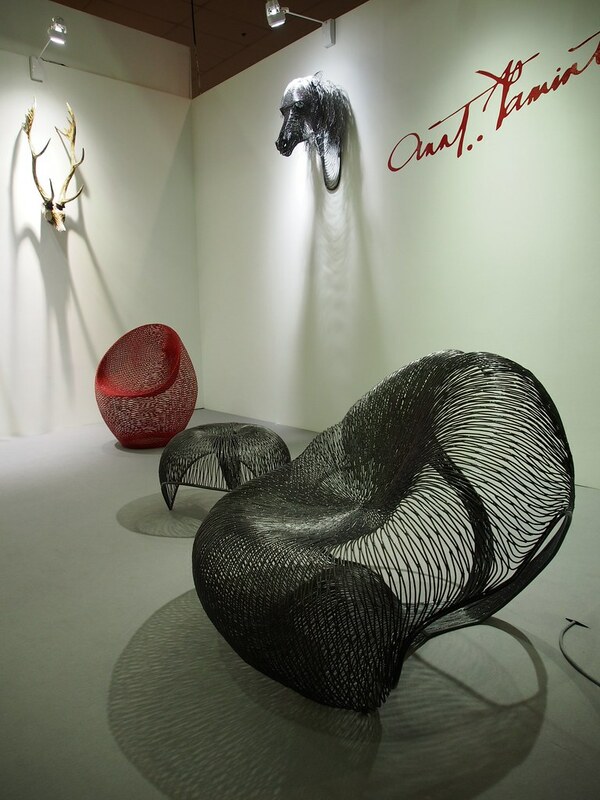 Loved Ann Pamintuan’s space at Maison et Objet Asia. 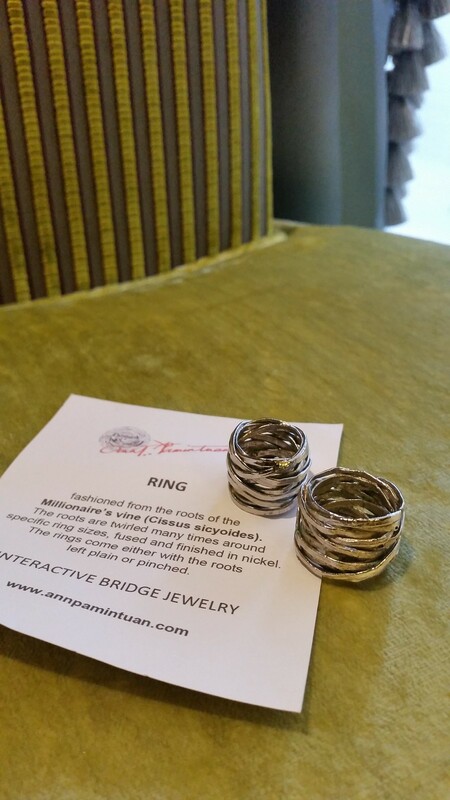 Ann gave me two of her rings. I love them! You can check out her work here. I got to hang out with my good friend who I miss so much, James Ong. He now heads all of COCONUTS media in Singapore. 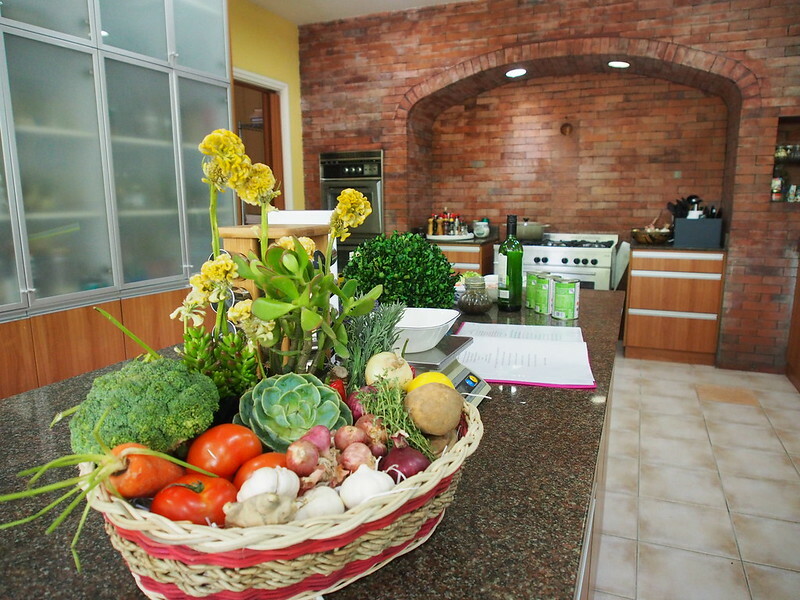 Check out Coconuts Manila. 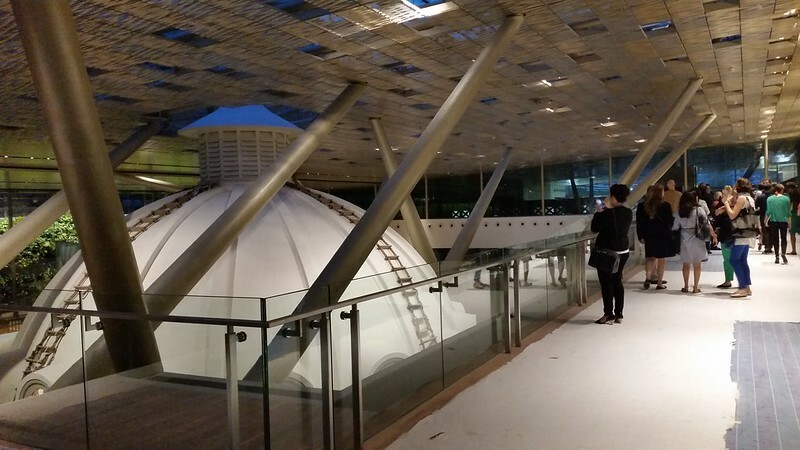 And since it was Design Week in Singapore, we were given access to the then yet-to-open National Gallery. This was the lobby of the former Supreme Court. 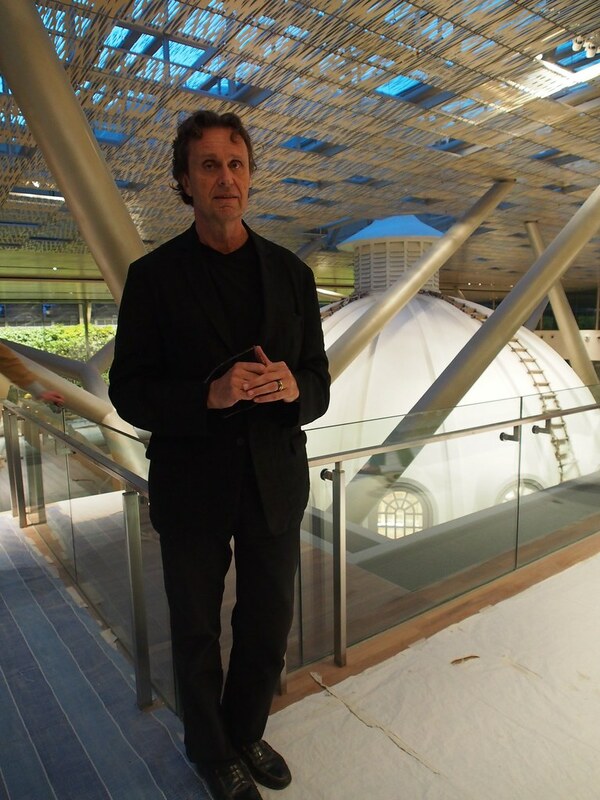 We were given a private tour of the ( then still under construction) National Gallery Singapore by the architect of the restoration himself, Jean Francois Milou. The atrium showing the rotunda dome at the Supreme Court Terrace. 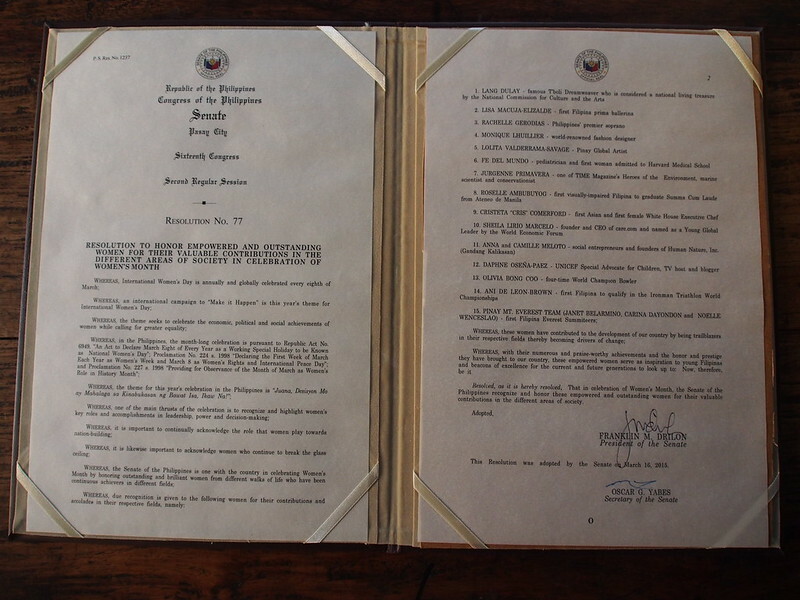 Officially “legit.” My name is in a Senate Resolution. I still don’t know how this happened. But wow, so grateful to be able to do good work through UNICEF… and that my parents and my daughter were able to witness this big event. Definitely a special moment in my career. Here is the story. 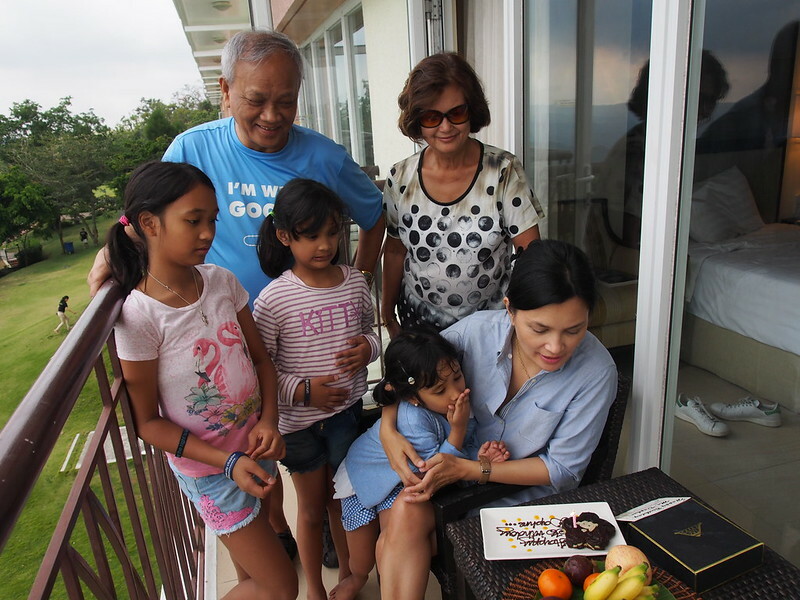 Spent my birthday weekend in Taal Vista Hotel with my family including my parents. 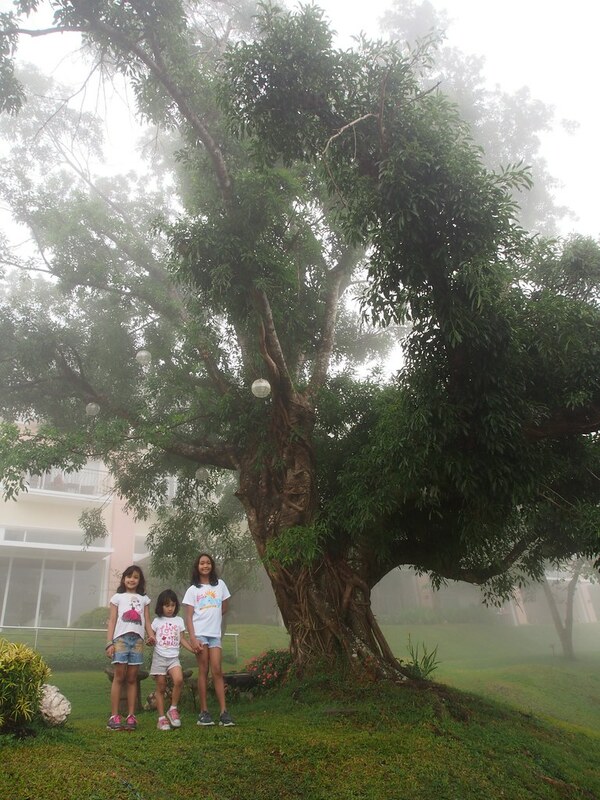 This tree in Taal Vista is so pretty. I continued my commitment to pilates. I still go two to three times a week. Options Studio is one my most special partners. Without pilates, my life would be full of body pain. Seriously. Pilates gives me strength, mindful posture, and efficient breathing. It isn’t about a fitness craze or lifestyle brag. Pilates, for me, heals me from the inside out. Read my pilates journey here. My sunshine girl graduated and moved up to what they call junior high, but I prefer to call it middle school (because I don’t want her to grow up too fast). 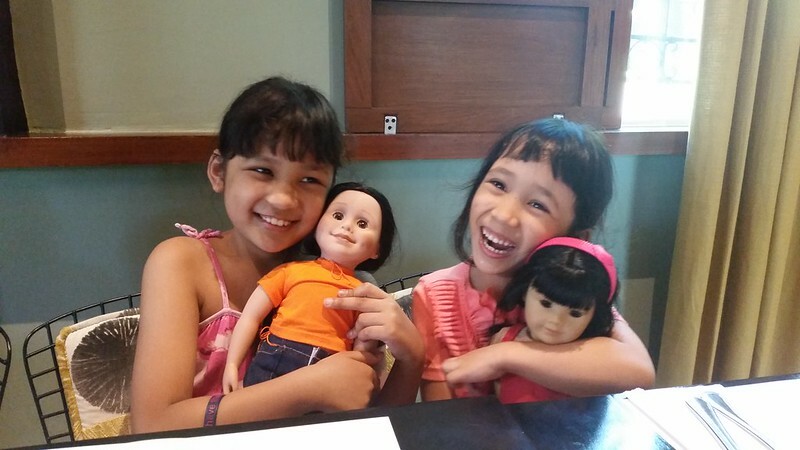 Lily and Stella still played with dolls. April was so incredibly hot, like always. But it just seems to keep getting hotter and hotter every summer. 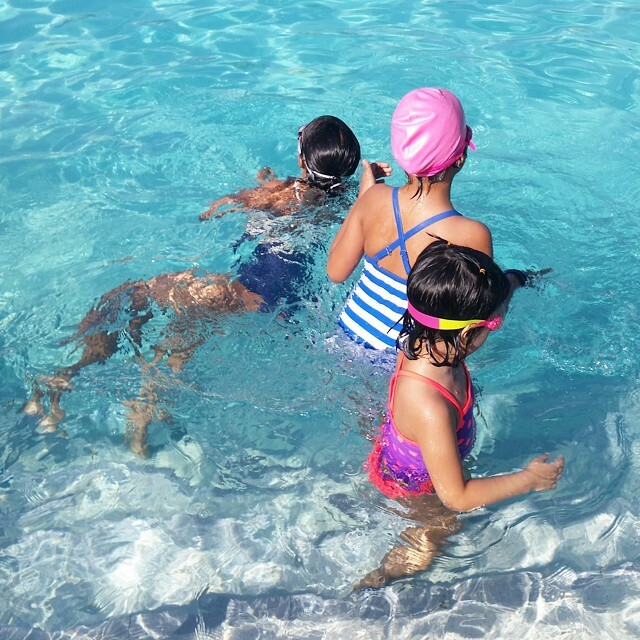 We spent mornings in swim class at our club. I learned some good quality slow cooking with Bettina Osmeña, who sells her amazing dishes at the Dasmariñas Village Bazaar. The girls continued crafting. 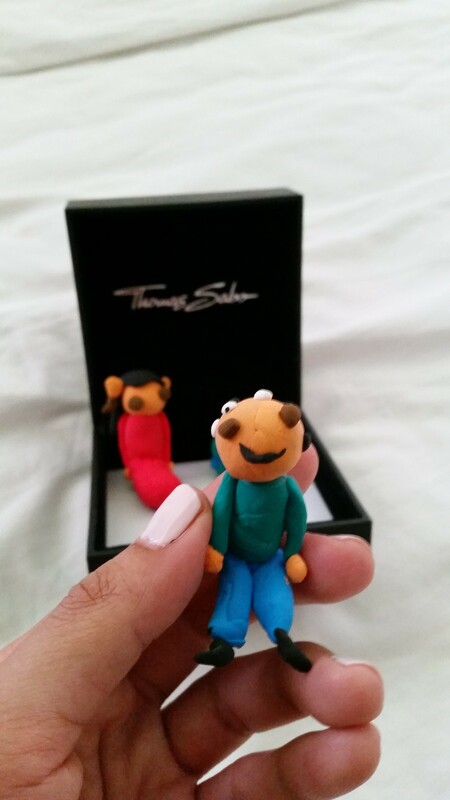 Stella got inspired by her big sisters and created little clay sculptures of us. 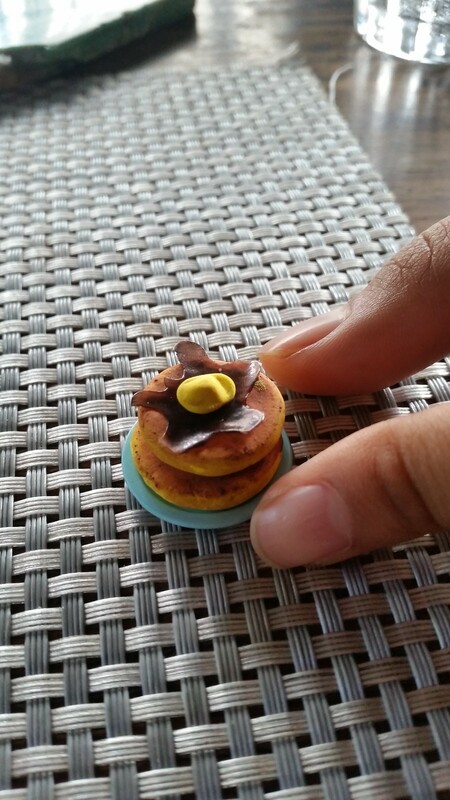 Soph improved her crafting (self-taught) and made a lot of miniatures. Cher came to Manila in April and we got to hang out one afternoon. We don’t have a decent photo together because all we did was giggle and cackle. She makes me laugh so much! I miss this girl! F girls forever! Leave a comment if you remember us F girls. Soph and I watched the Demi Lovato concert. 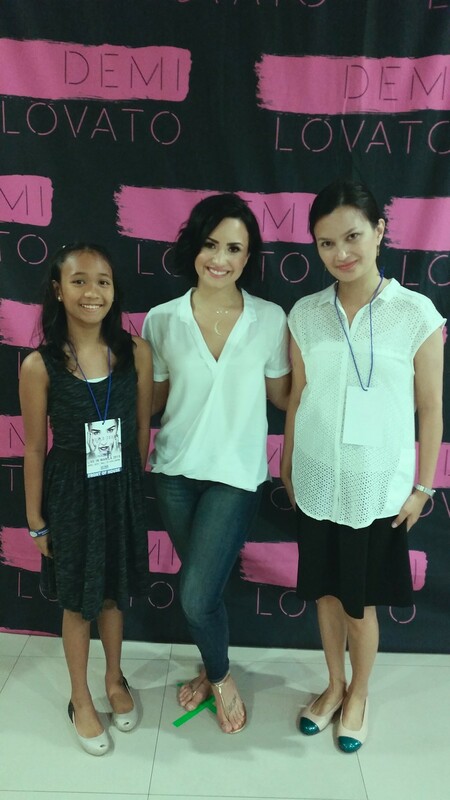 And we had this rare opportunity to meet Demi Lovato backstage! Thanks to MJ Juco of MCA Music (Universal). Soph was ecstatic! 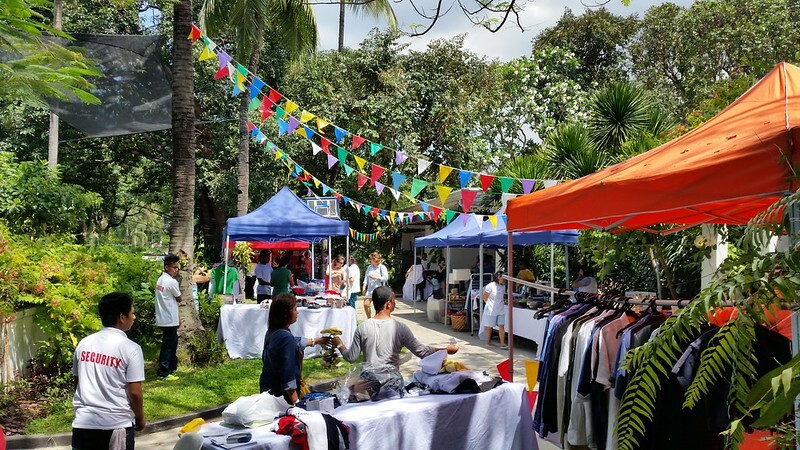 At the height of summer, we had the most amazing garage sale at my friend’s house. We had one in 2014 too. I hope we can maintain an annual garage sale. I’m in a constant state of decluttering. Every spring I get to unload what we don’t need, while meeting some of my readers and having fun along the way. I remember this day in May. It was one of the hottest days. We took off from the city and went to our little plot. I’ve been saying this for years, but this is where we plan to build a cottage. I hope that we find the time and the will to actually start. I’m happy that we started planting already. 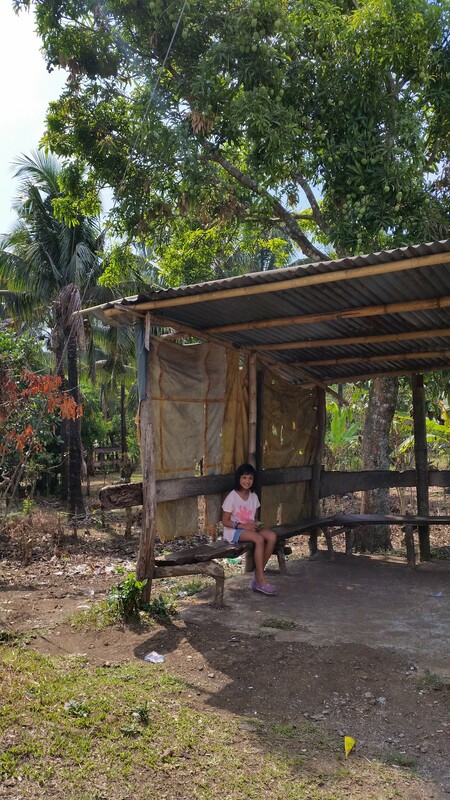 Lily loves it here, as long as she has shade from the sun haha, and hopes to have her own “she shed” for creative projects. 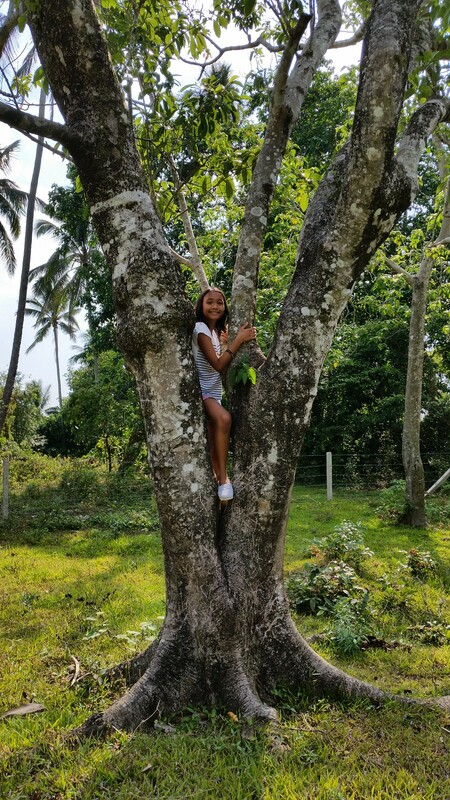 Sophia has always loved nature. She is happiest when she is touching the earth and running freely through fields. I love that she loves this place. 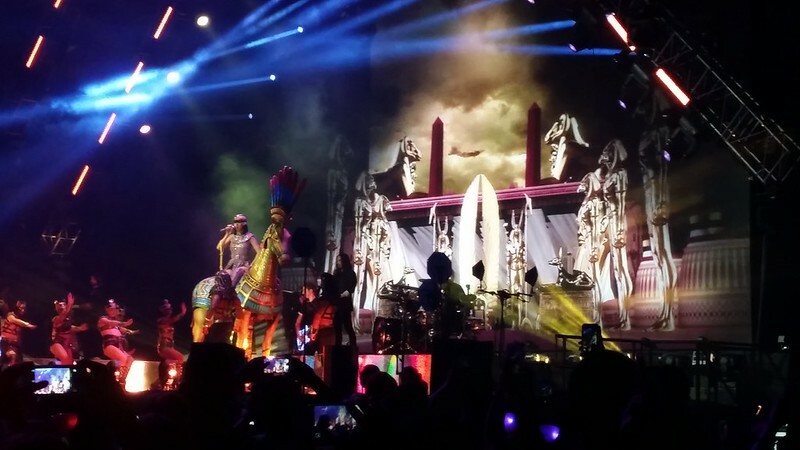 And definitely a highlight of 2015 – the Katy Perry concert. I splurged and bought four tickets! Then a day before the concert, the promoters contacted me and gave me free tickets!!! Whoa! Instant upgrade. 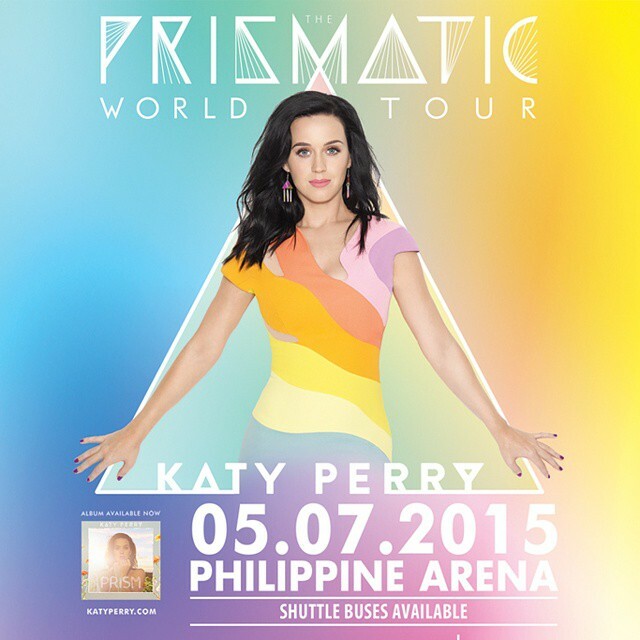 Philippine Arena was enormous. The girls loved Katy Perry’s performance. At one point I caught Stella singing with her eyes closed and dancing in her seat. It was a special mommy moment for me. Sophia’s crafting continued and got better. 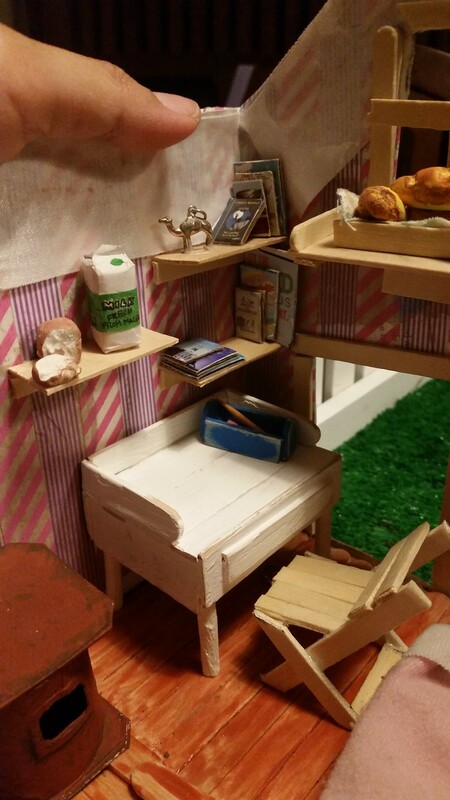 She made this little world all by herself using scrap material at stir sticks from Starbucks! 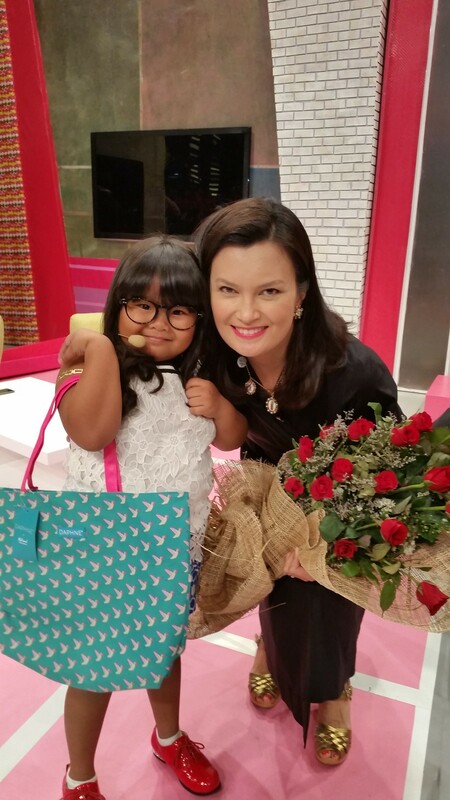 Also in May, the producers of Eat Bulaga invited me to appear as a guest in The Ryzza Mae Show. I showed Ryzza Mae my DAPHNE®&NBS products. What a riot! Watch highlights here. 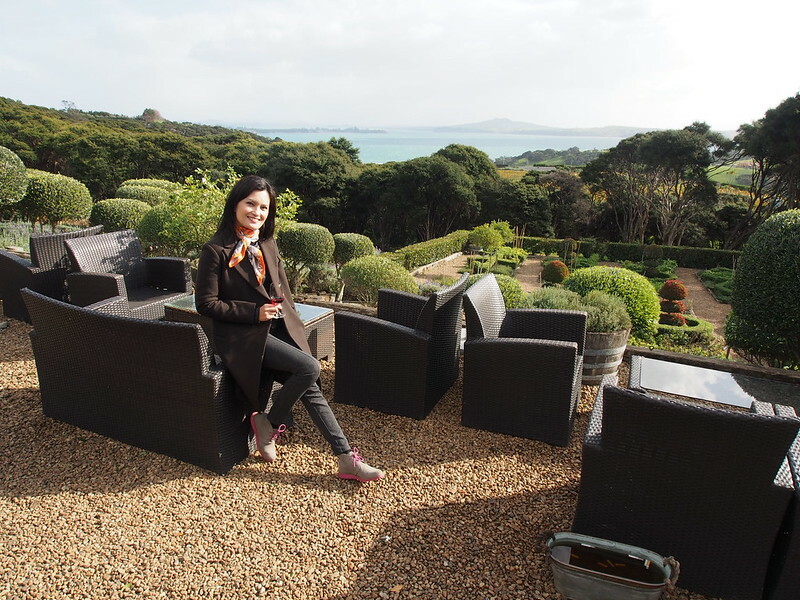 Then at the end of May, I went to New Zealand! It was my first time to see this part of the world. 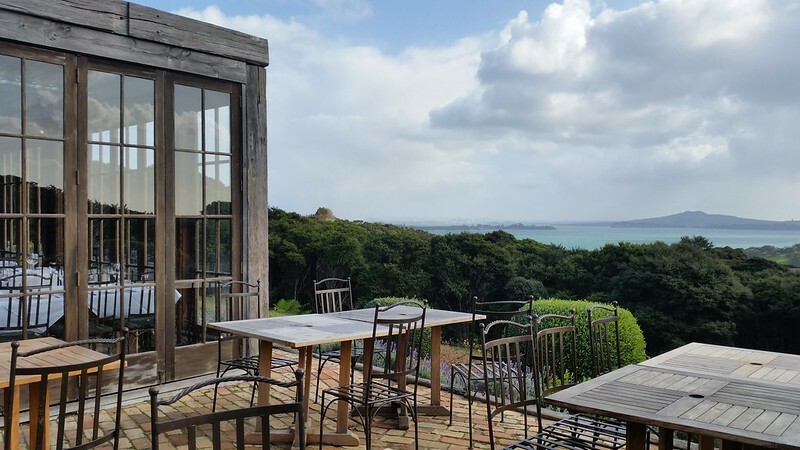 Mudbrick Winery in Waiheke Island just off of Auckland was beautiful. Seriously, New Zealand took my breath away. 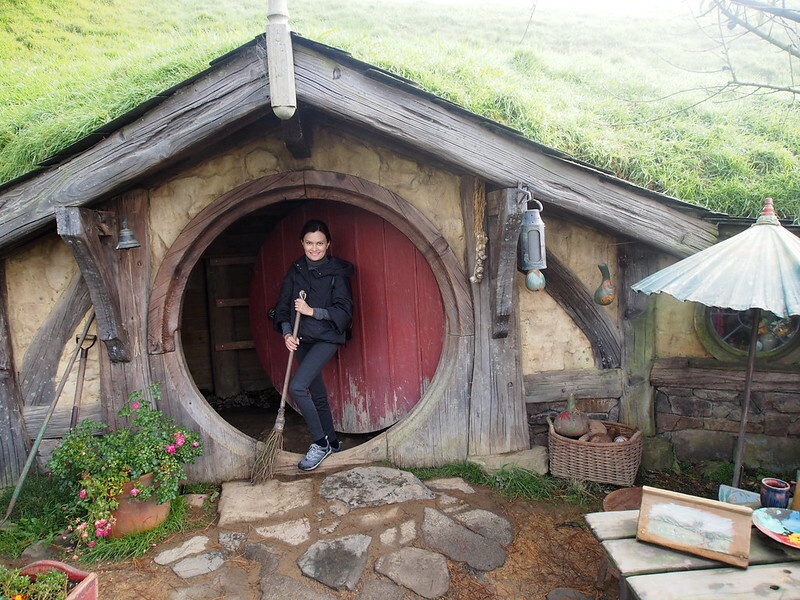 Hobbiton was fun. Here’s my video. 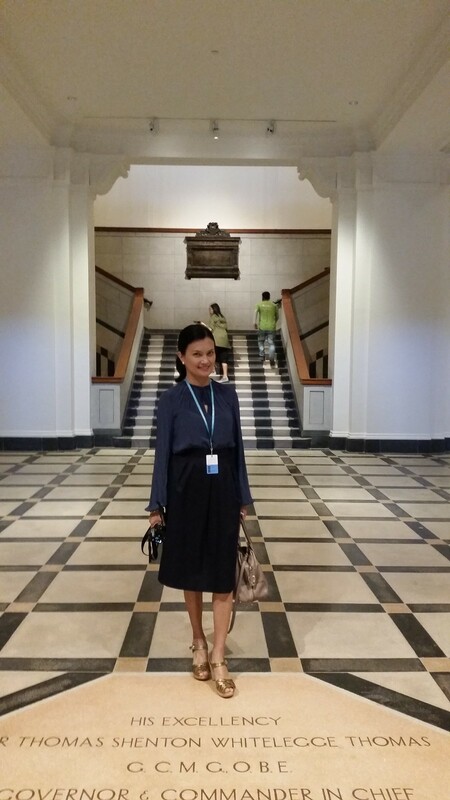 I was among the group of journalists from ASEAN invited by the New Zealand government. Part of our itinerary was to visit and know their aviation industry. 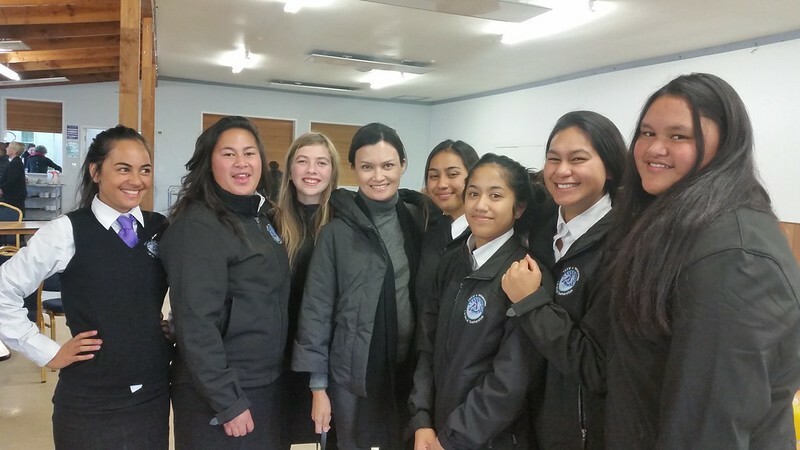 Met some amazing Maori school youth at the Miraka dairy farm. Don’t I look Maori? One of the elders looked so much like my grandmother. The Maoris of Miraka farm performed a Powhiri for us. 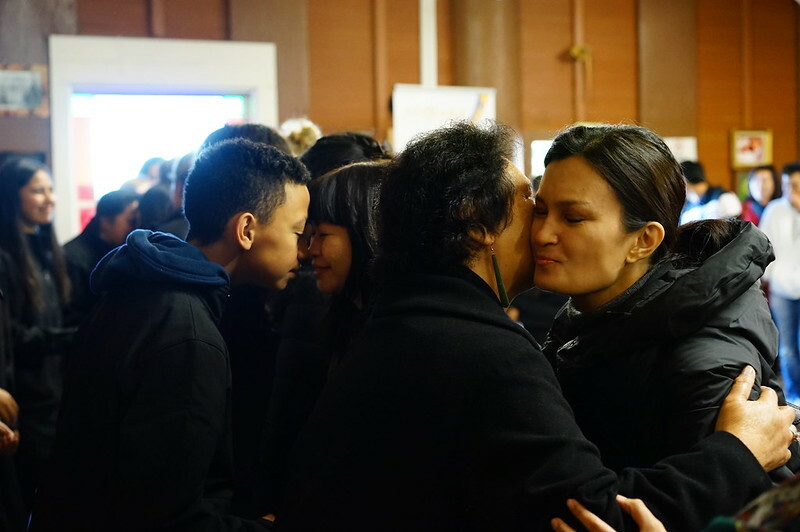 A powhiri is a traditional welcome ceremony in a marae (a communal sacred place) that is only performed for special guests or an event like a dedication of a building. In the end of the powhiri, we all went around the room and did the hongi (nose rub) with all the Maoris present. It was amazing. 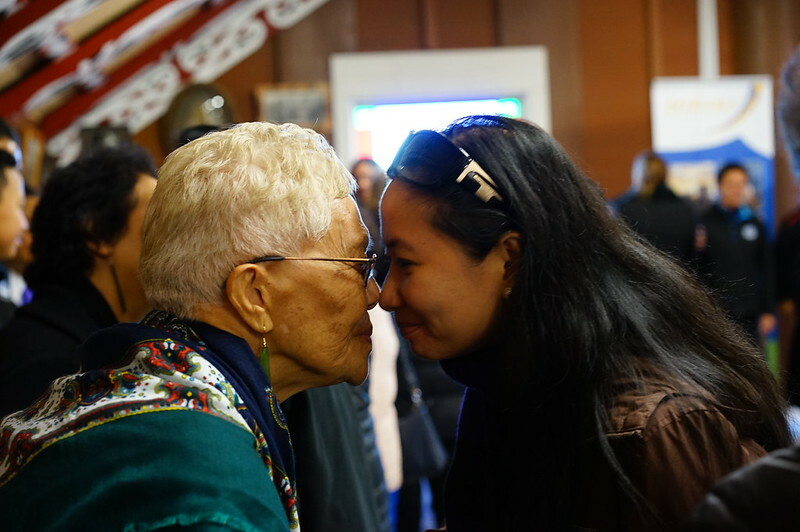 (The photographer was only able to capture the kiss this Maori woman gave me, and not the hongi.) I was very moved by this ceremony and felt so connected to the Maori people. 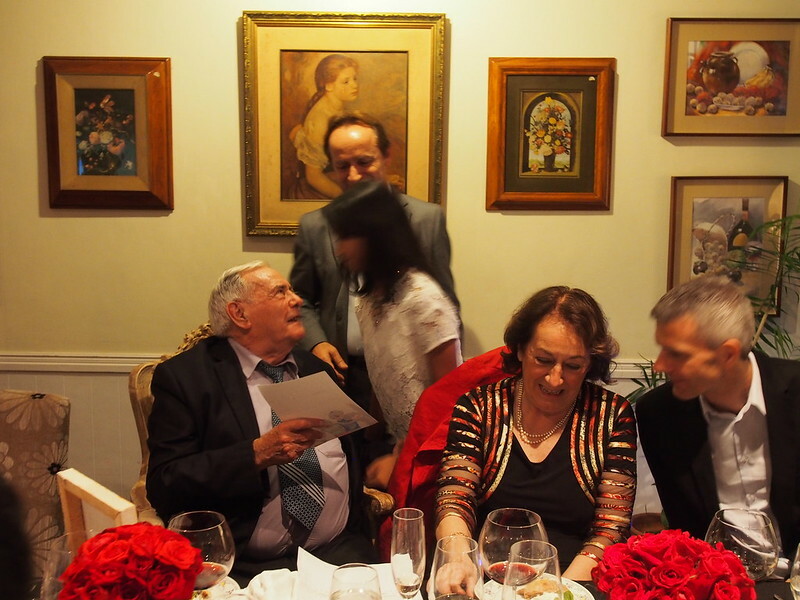 Doris Dumlao of the Philippine Daily Inquirer had a lovely photo souvenir of the hongi. I met the Prime Minister of New Zealand John Key at the National Museum in Auckland. 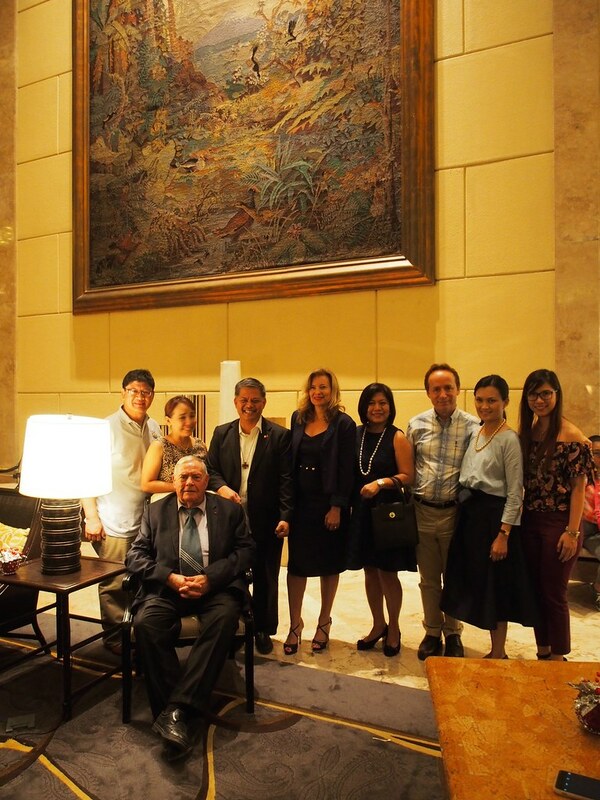 He spoke to us ASEAN journalists about their 40 year relationship. 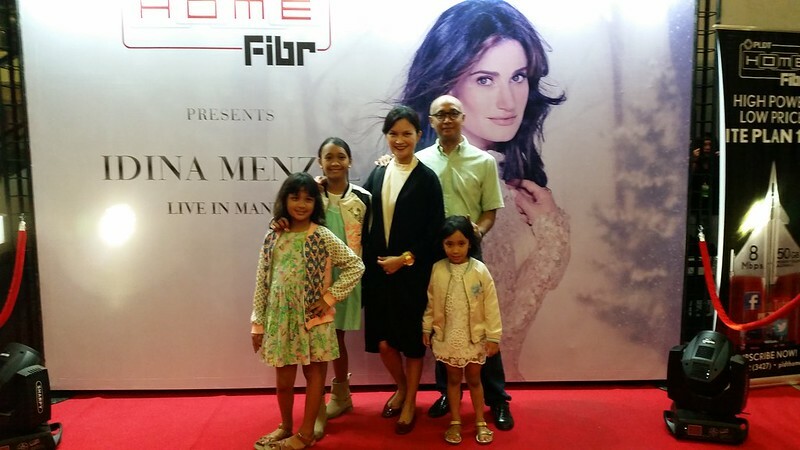 Back in Manila in early June, PLDT Fibr invited our family to watch Idina Menzel. The kids were thrilled! Stella loves Defying Gravity and Let it Go. Idina was amazing. She kicked off her shoes and performed her concert in bare feet. For some strange reason, I developed a frozen shoulder in New Zealand. It started when I had difficulty putting on my coat (like a senior citizen!). 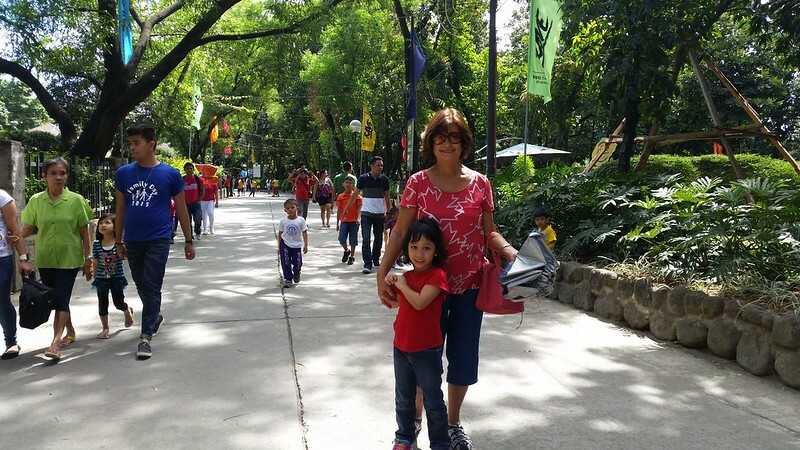 By the time I got back to Manila, my movement was so constricted. I continued my pilates. Ole Eugenio and four other pilates instructors at Options Studio worked with me. After many months of continuous rehab pilates my frozen shoulder got better. I am ok now! It’s true. Just keep moving! And #movewithoptions. 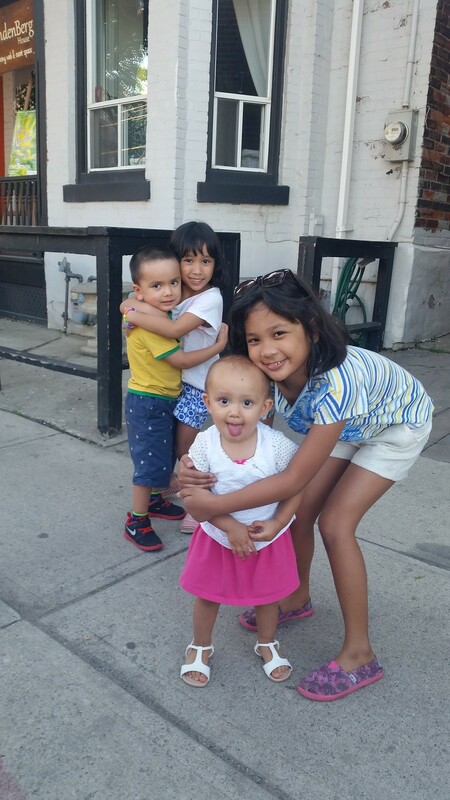 Then, on what seemed like a whim, we flew to Toronto to spend one month with my family in June. 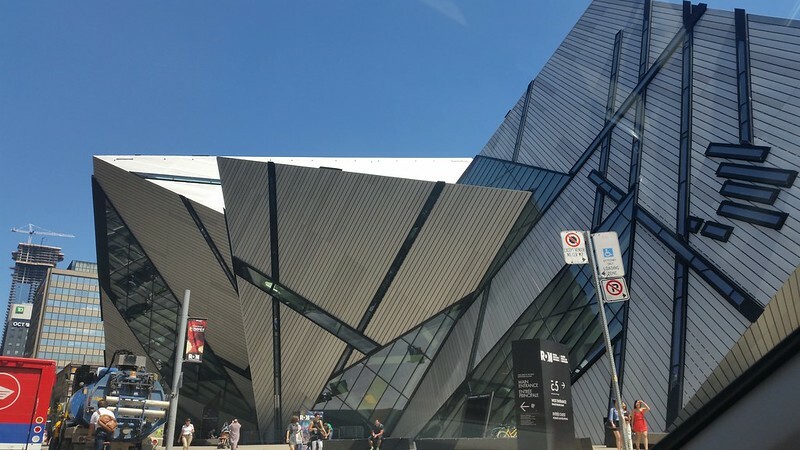 This is the additional wing of the Royal Ontario Museum, designed by Daniel Liebeskind. This was once my “backyard” and “playground.” Some of my art history classes were held at the ROM. And I used to live up the street from here. 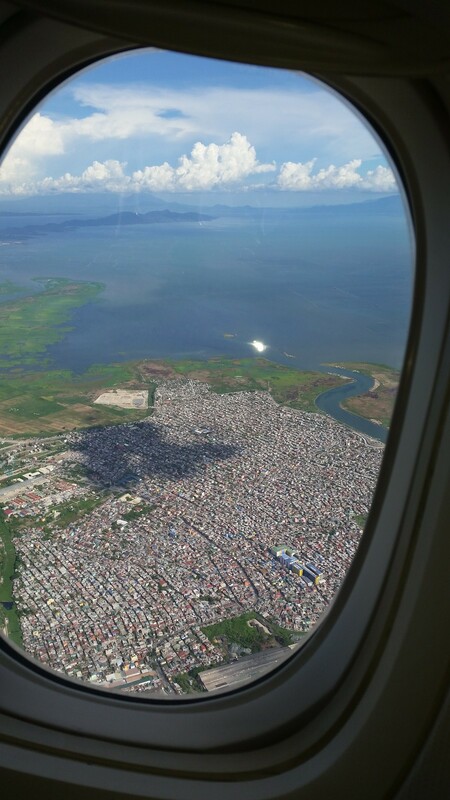 On the flight out of Manila, I snapped this photo from my plane’s window and posted it on instagram and Facebook. By the time we stopped in Vancouver, my photo had gone viral. My photo and Facebook page did the rounds. 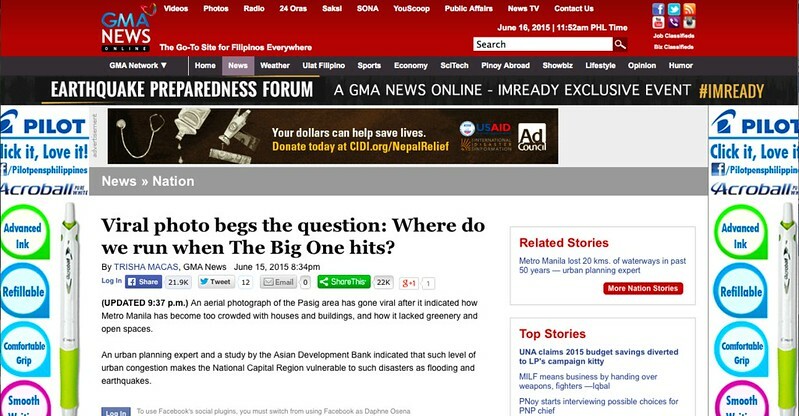 It was covered by CNN, TV5, ABS-CBN, GMA7 and many online journals. This photo is still being used (sometimes without permission) up to now. 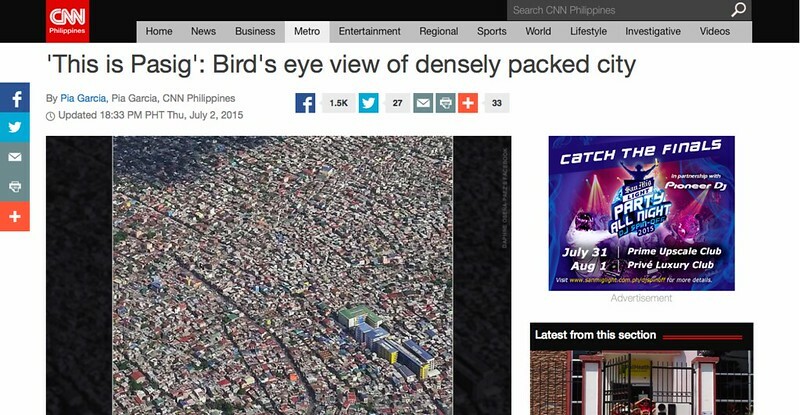 Funny how it had to take an accidental aerial shot to show the meaning of population density and congestion. And it sparked many discussions about population density, disaster preparedness, and congestion. My urban planning education was not wasted! When we are in Toronto, we never miss a trip to St Jacobs Farmer’s Market. It burnt down a few years ago. It’s so nice to see that they have rebuilt and reopened. When we are all together, even walking down a random street becomes sweet memories. 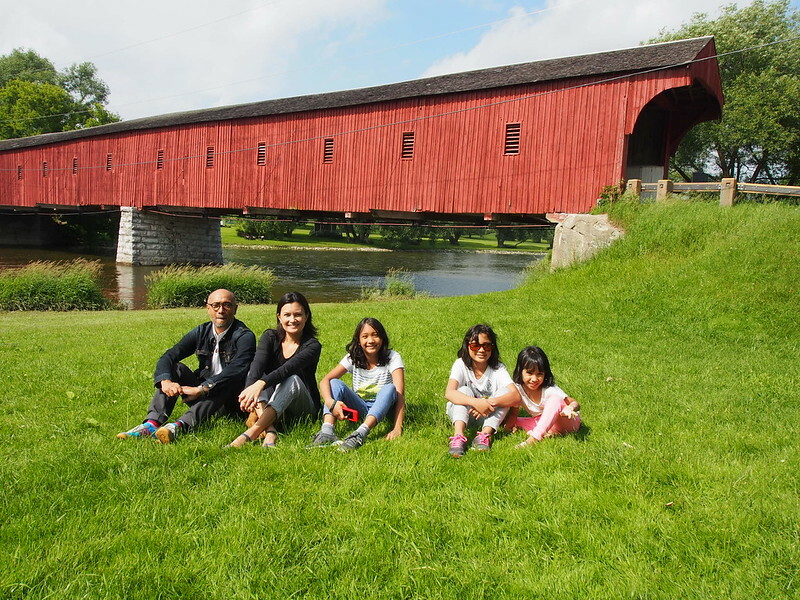 At the last remaining covered bridge in Ontario, the West Montrose Covered Bridge in Waterloo. 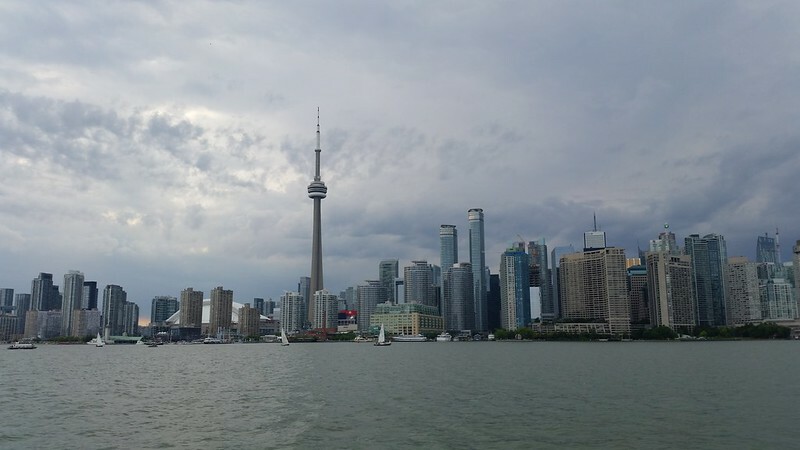 I can’t believe how much the Toronto skyline has changed. 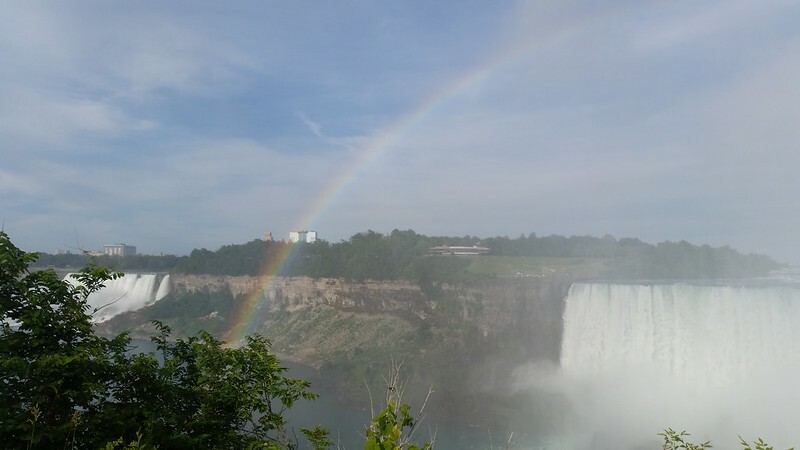 These days, we barely make time for Niagara Falls. It’s always a 20 minute photo op and never a destination. Why oh why do I take this place for granted? I need a whole day to have our kids do the attractions, no matter how cheesy they are. 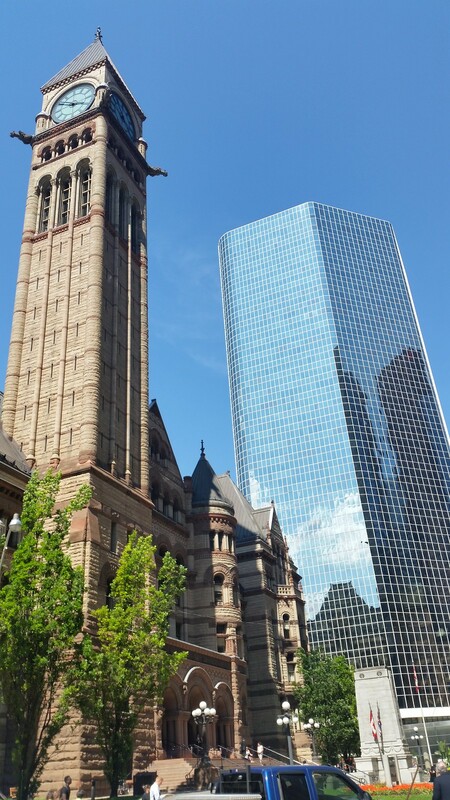 Toronto – where old and new co-exist with harmony. 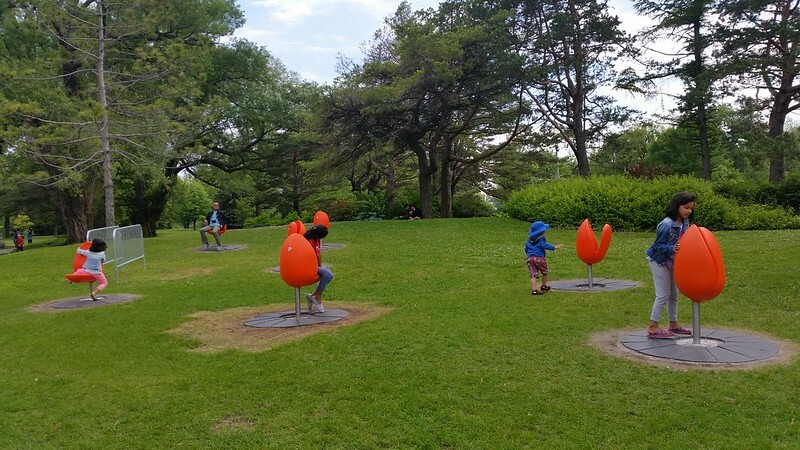 The newly installed Tulpi chairs at the Toronto Island park. It’s just been half the year, there are more little stories. Click, click. Always. 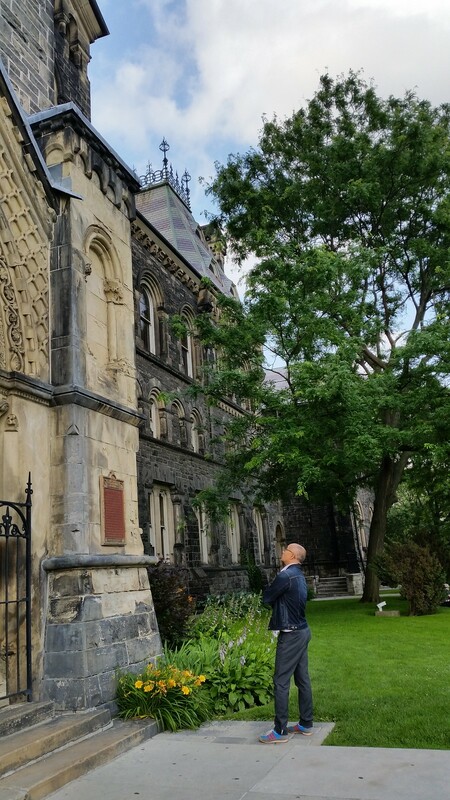 A visit to my alma mater, University of Toronto. 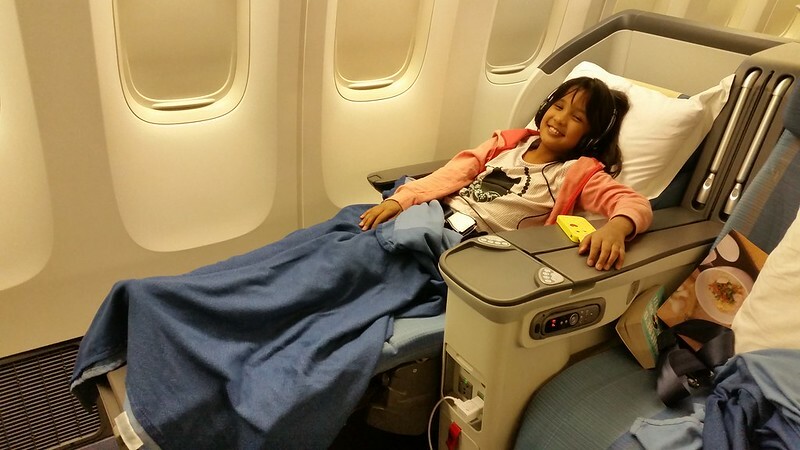 PAL Business Class rocks! We earned this! 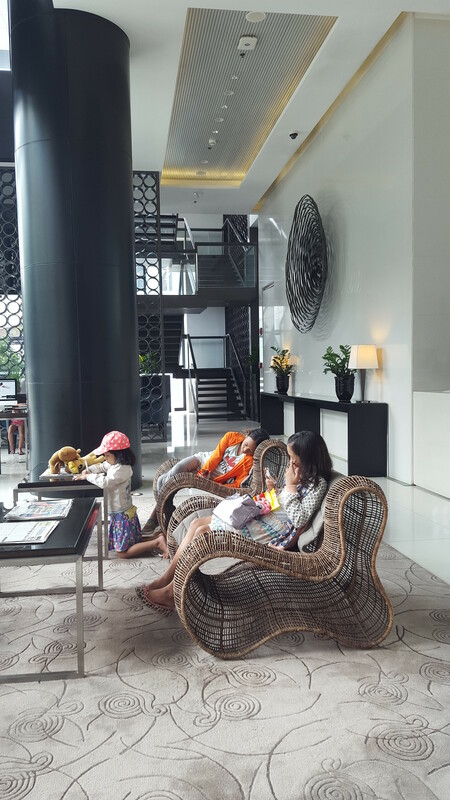 How I wish this could be our normal travel situation. 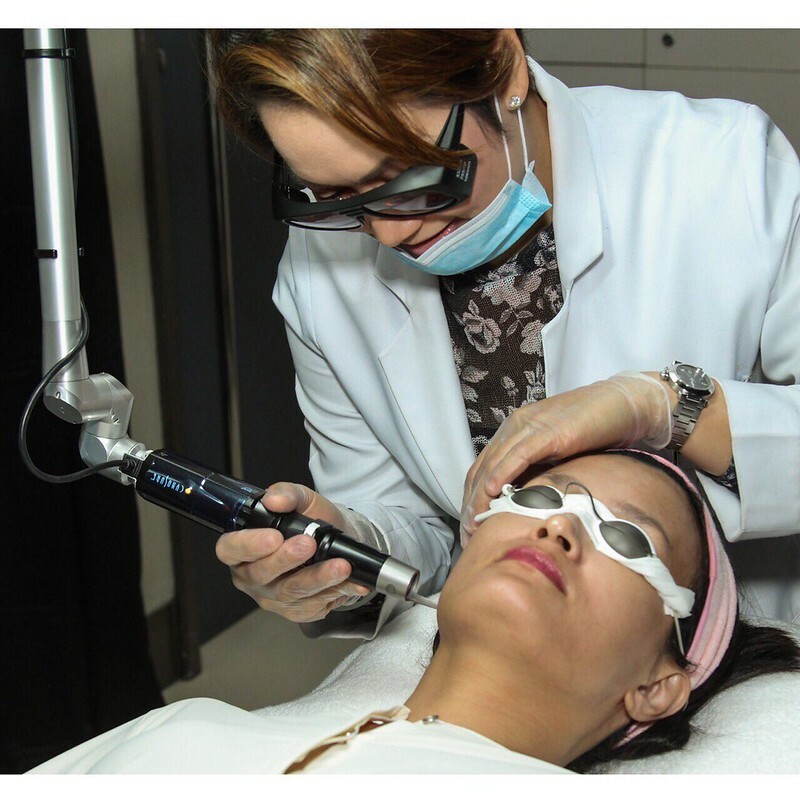 In July I tried Picosure at Belo. 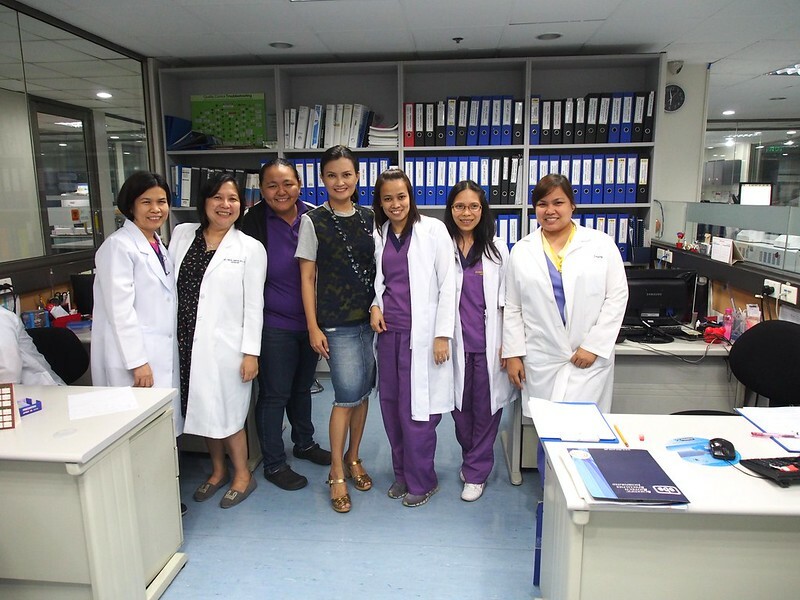 Dra Sison was amazing. She knew I was nervous and she understood. She gave me numbing creme first. It was a breeze. This is what I looked like three minutes after our session. No down time. 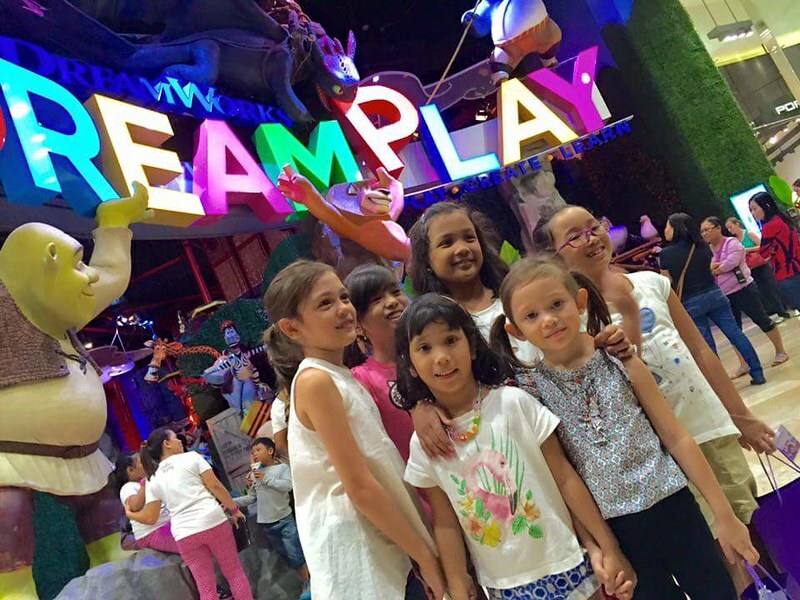 The most fun indoor playground, Dreamplay. This was the year I hosted a gazillion playdates for my kids and their friends. 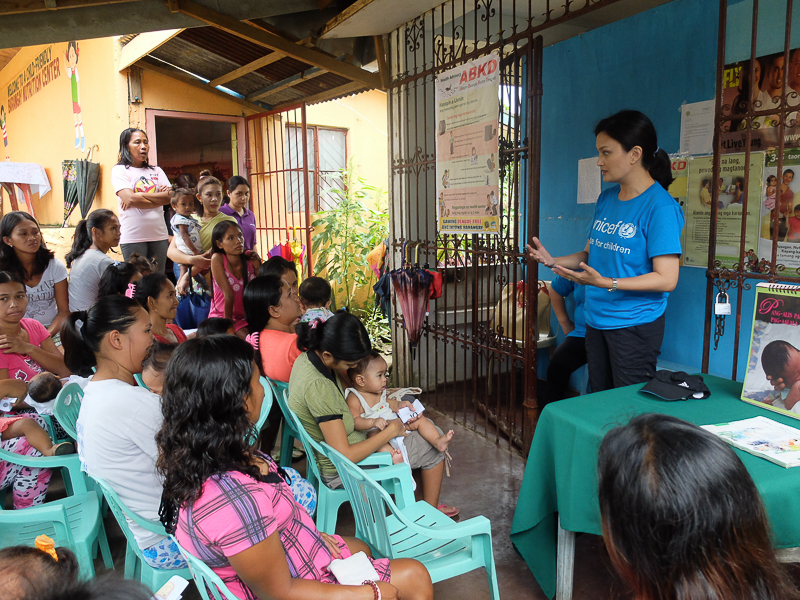 In August, I did a field visit in Naga for UNICEF. At the NICU Naga hospital. I spoke at the Congress (House of Representatives) regarding the need to support mothers and infants in their first 1000 days of life, also in August. 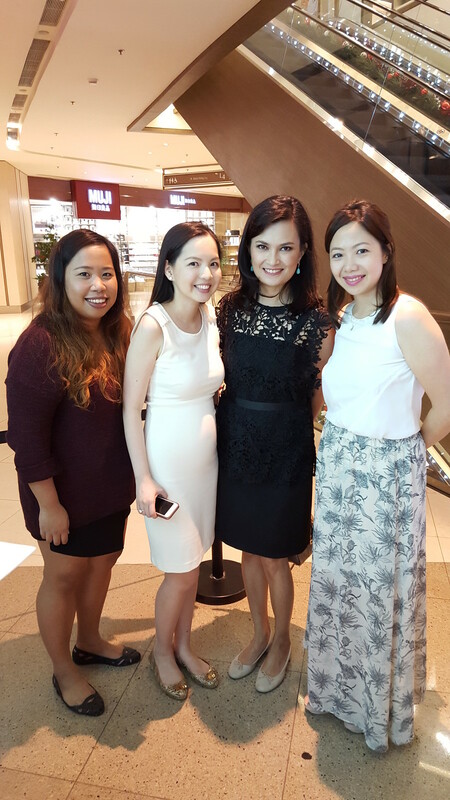 I hosted F&C Jewellery launch in SM Makati and met blogger Kim Jones and Camille Co. It was great to see Jenni again. 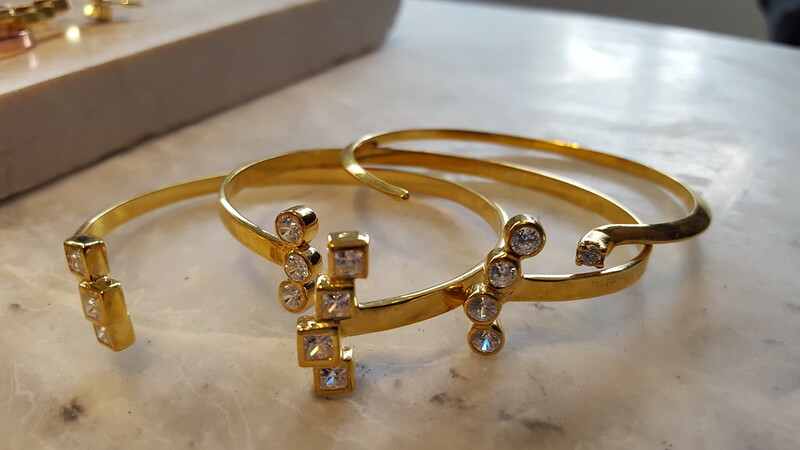 F&C has some very beautiful fine jewellery. 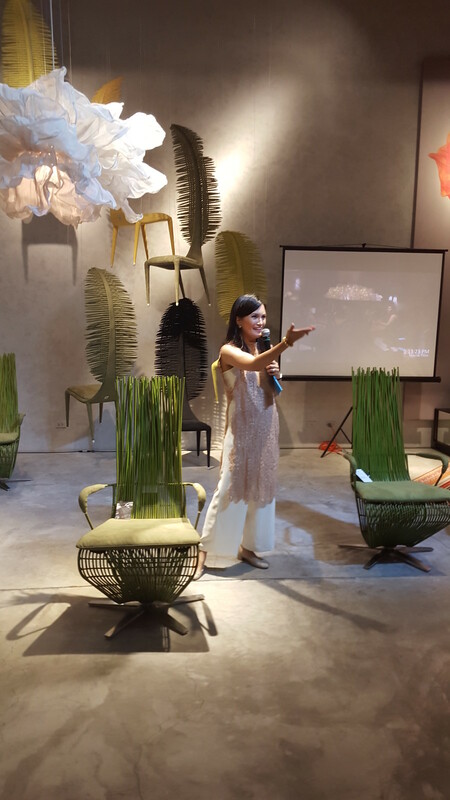 Had the honour of hosting the launch of Maisen for the Suyen Group. 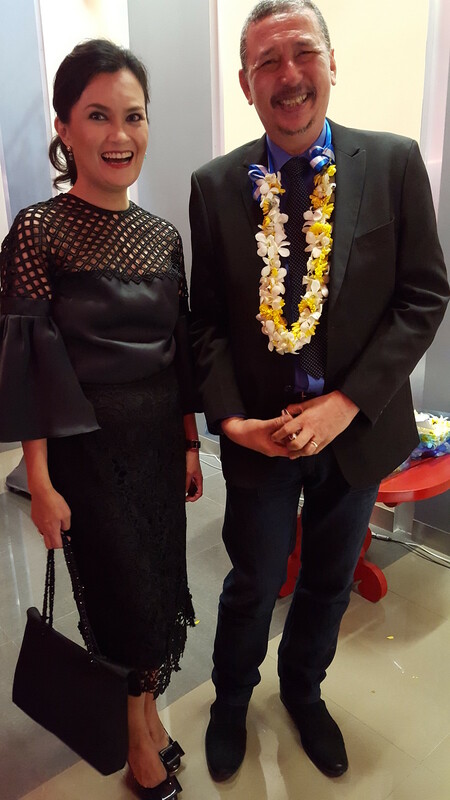 In photo with one of the women I most admire, Mrs Nenina Lim. (And Ben Chan behind us). 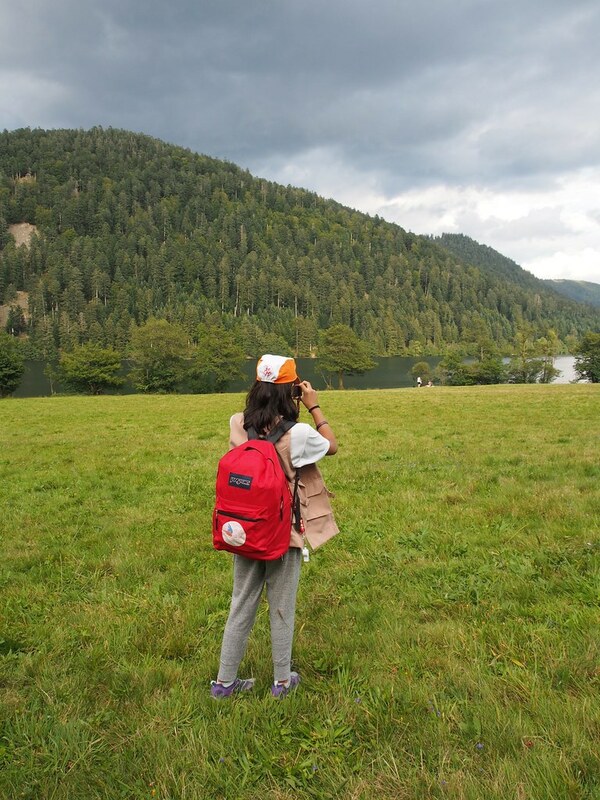 Towards the end of August, Sophia went to France for two weeks (I tagged along as a parent volunteer and journalist.) 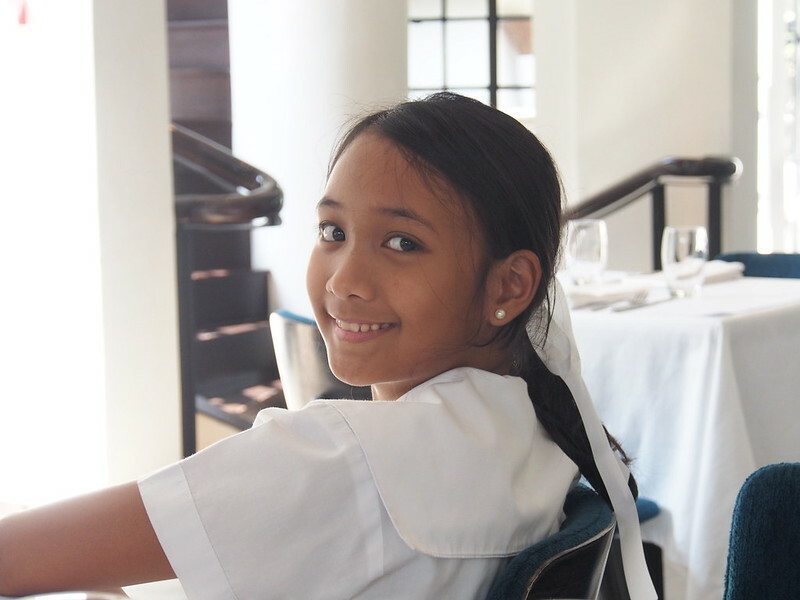 She was chosen by Mirasol Foundation to represent the Philippines at Copain du Monde, a summer camp sponsored by Secours Populaire Francais. Part of the program was spent in Paris for a day. I am so very proud of Sophia for what she has done here. 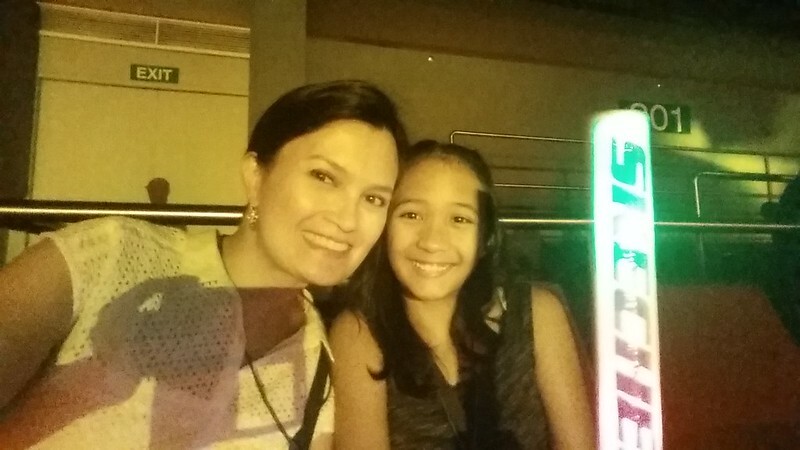 She wrote about her experiences in the Philippine Daily Inquirer. Copain du Monde was an excellent program. 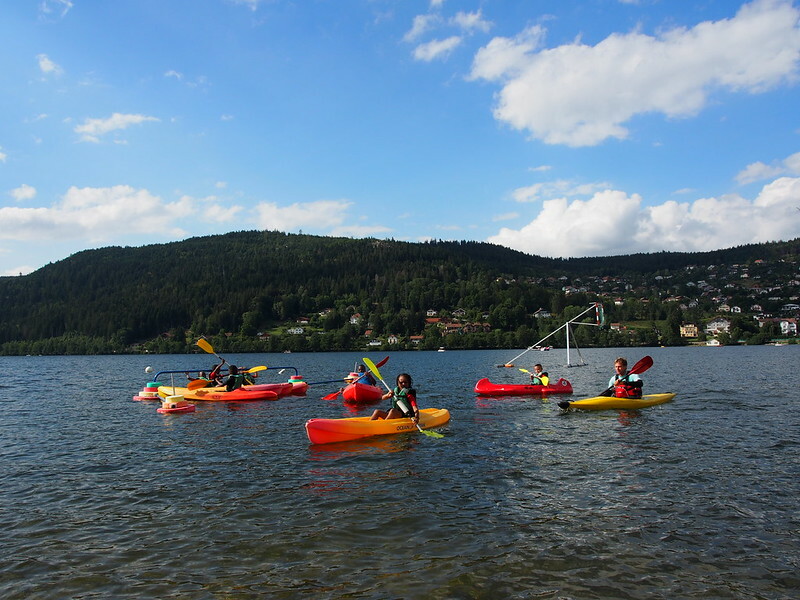 One of Soph’s favourite activities was kayaking in Lake Gerardmer. Hiking to camp (They slept overnight in a tent). 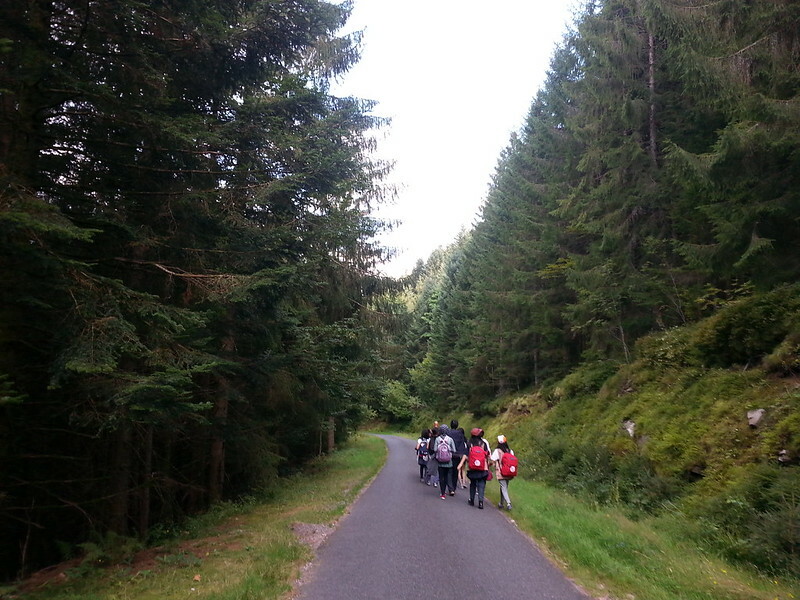 Hiking through the woods in Gerardmer. 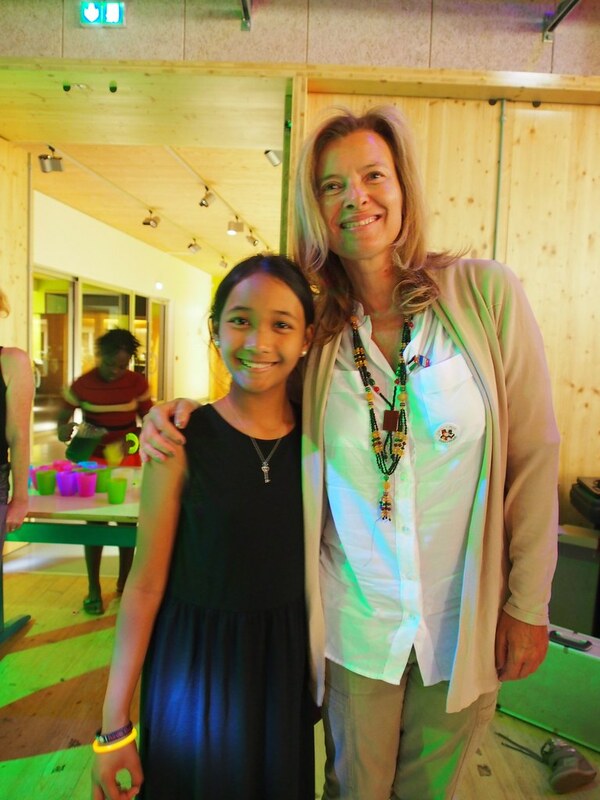 Soph met and danced with the ex First Lady of France, Valerie Trierweiler, who is a patron of Secours Populaire Francais. You may watch the video of Soph’s camp experience here. Back in Manila we watched the musicale that was written and directed by my brother-in-law Fr Dennis Paez, SDB. They performed this at Meralco Theatre. 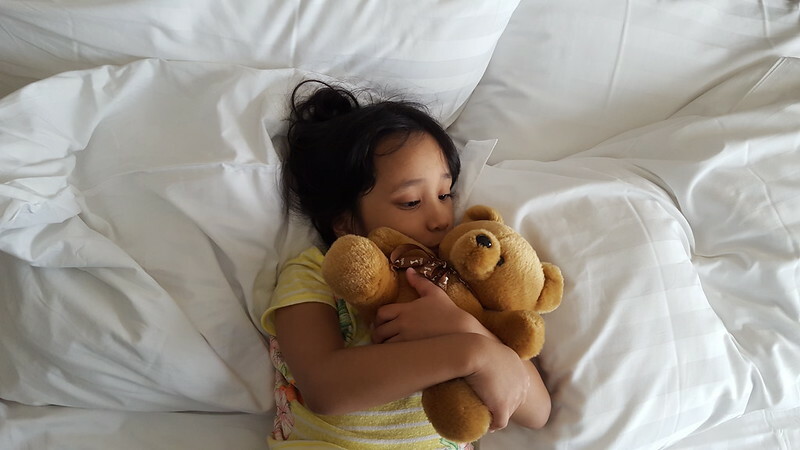 We spent one night at the Presidential Suite of City Garden Grand Hotel. Perfect staycation place. We never left our room. It was enormous. 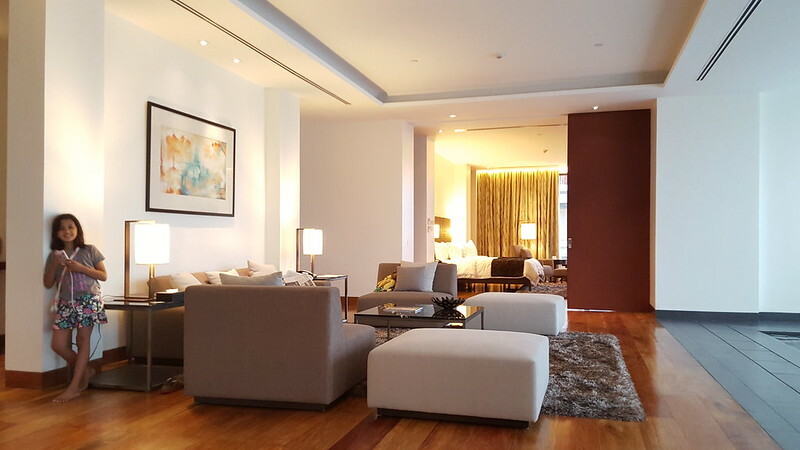 Such a beautiful room at City Garden Grand Hotel. 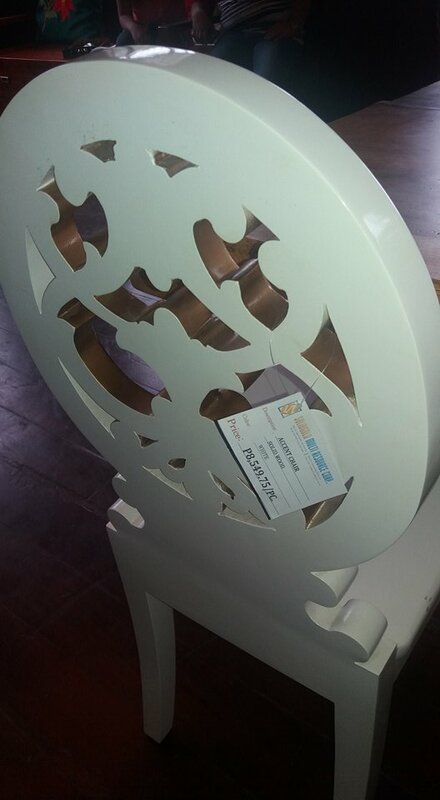 My chair was faked again and displayed in Iloilo venue set up for APEC. SM immediately pulled out the chairs from display. 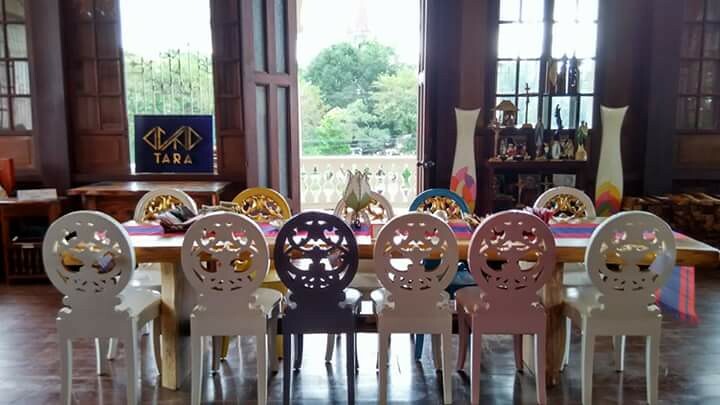 But this manufacturer – Solid Gold – never apologized nor stopped making these chairs. Please note that the DAPHNE® Chairs are no longer being manufactured or sold. We have retired the design. But we still own it. So, no… it’s not ok to copy. In the pop culture front, I discovered the joy of watching AlDub as it unfolded during its early weeks. I kept it a “secret” in August. Then in September, I came out. haha. 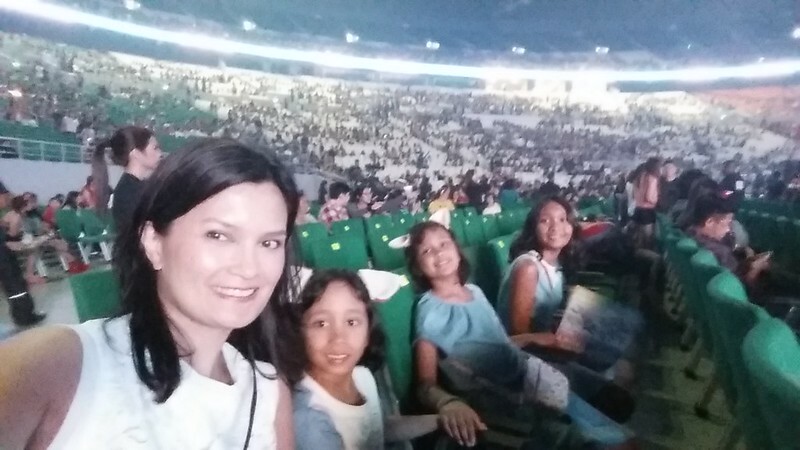 This blog entry on Aldub Fever went viral. My friend Stephanie Arambulo worked on the tandem’s first ever TV commercial (they have so many now). And she surprised me with this fan sign. 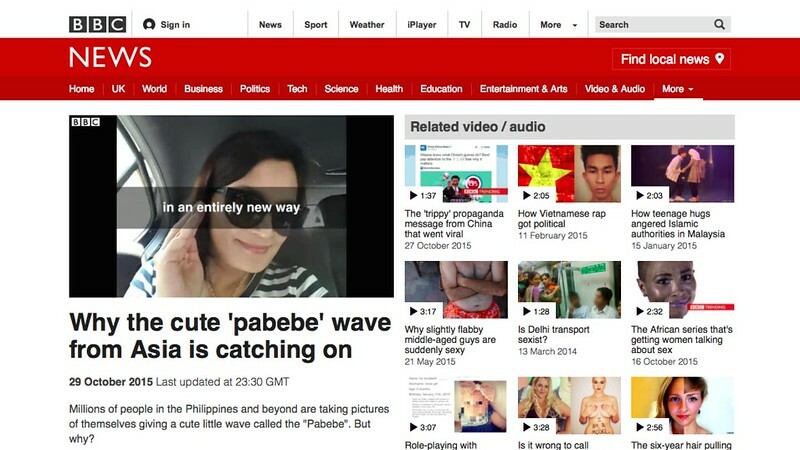 Because of my “analysis” of the Aldub phenomenon, we made it to the BBC. 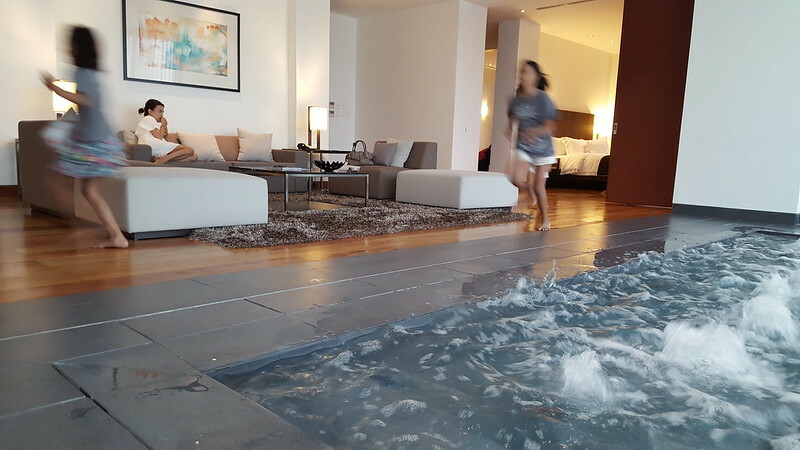 Another relaxed weekend staycation — at Seda Hotel BGC. We love staycations. 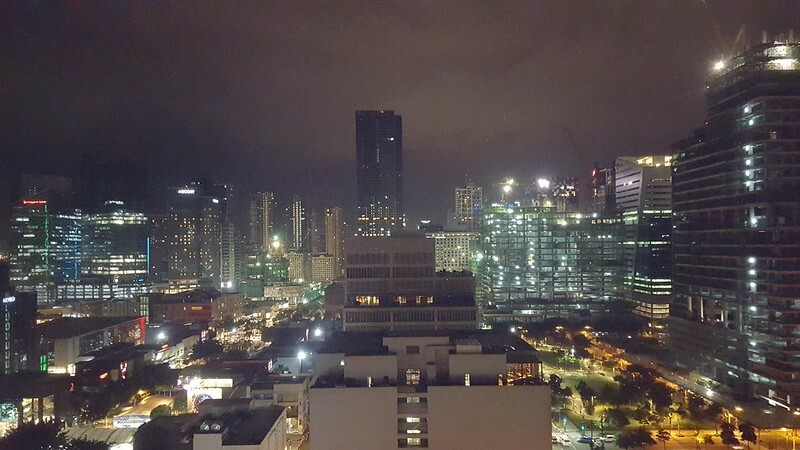 View of BGC from Seda Hotel. The tooth fairy came for Stella’s tooth. I have been wearing K&Company since 1999. And I cannot believe they still use me for their photoshoots. What a privilege. 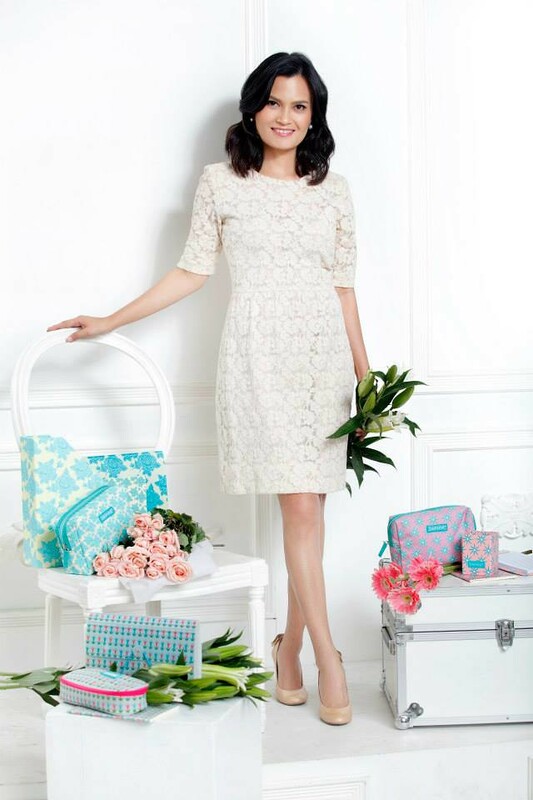 The K&Company Holiday 2015 collection was gorgeous. October always brings us breast cancer awareness events. Here at the I Can Serve fashion show with my good friends Kara Alikpala and Katherine Cheng. Also in October I hosted the opening of ManilART. In photo with me is artist Jose Tence Ruiz, a former colleague of Patrick in journalism. 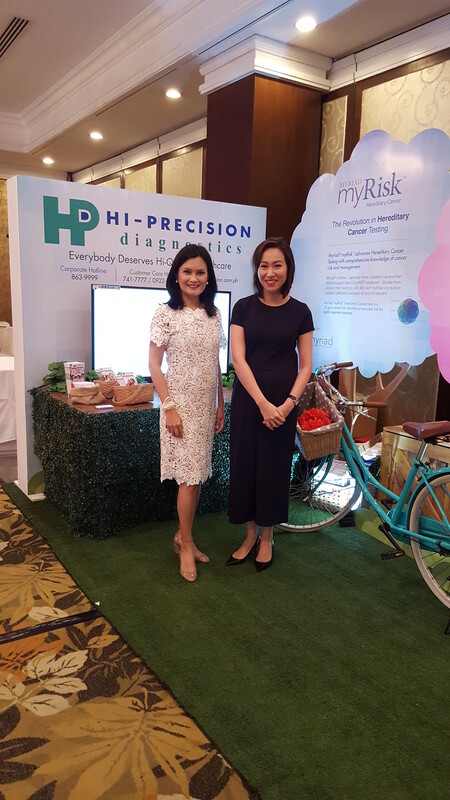 Still in October, I hosted an evening of talks on hereditary cancer screening by Hi-Precision. If you think you are at risk of cancer because of your family history, it may be worth inquiring about this procedure. It’s the same one Angelina Jolie took, which determined she carried the BRCA gene. 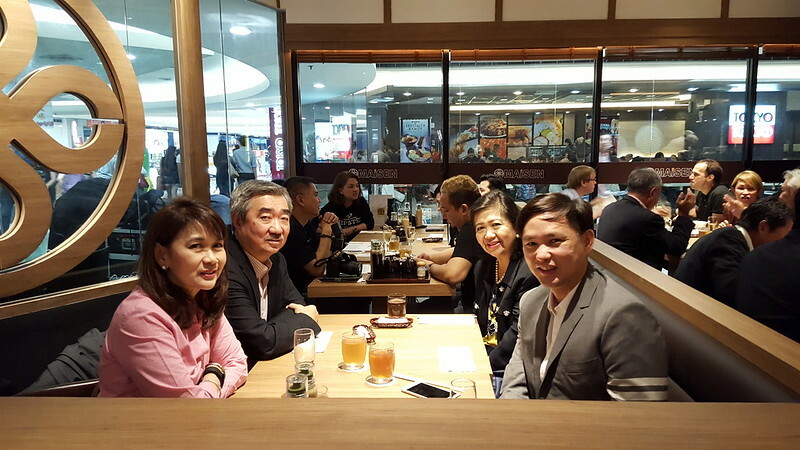 I had the privilege of hosting another branch of Maisen opening, this time in SM Mega Mall. A rare casual photo of SM’s top executives. 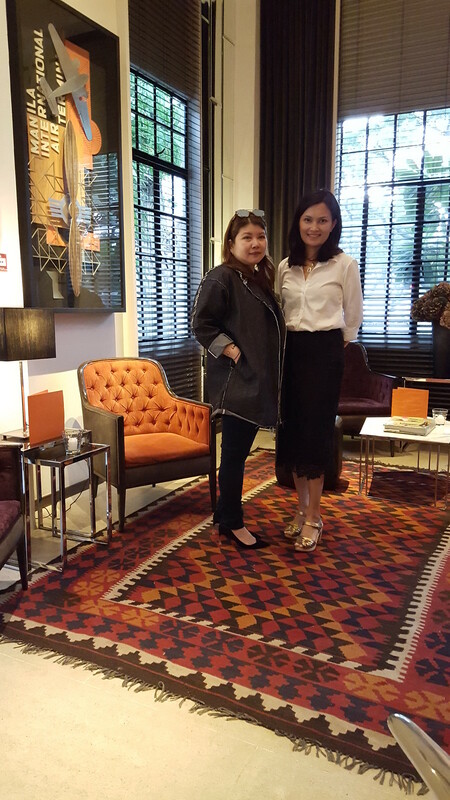 During my trip to Singapore for Maison et Objet Asia, I met the editor and publisher of Design Anthology magazine. 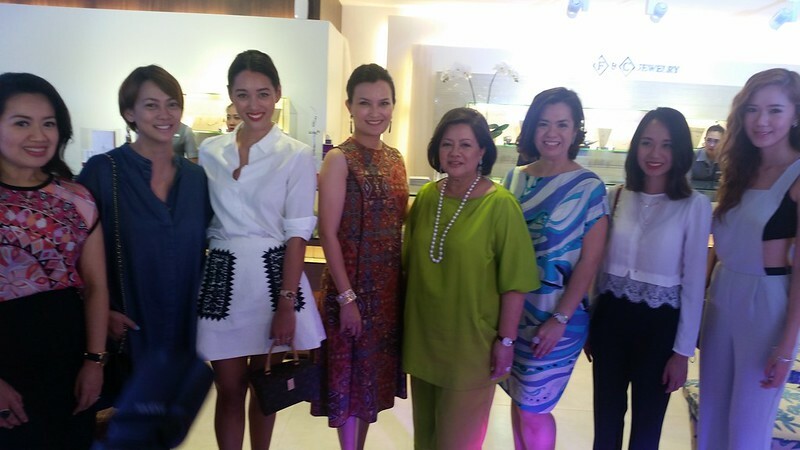 They came to Manila in October and co-hosted a party with Maison et Objet at the stunning home of Cynthia Almario. Design Anthology had invited me to write for the special Manila issue, however I couldn’t commit time-wise. Hoping this year, I get to do more writing again. October is also the annual Jewelmer Gala. I will never stop loving golden south sea pearls. 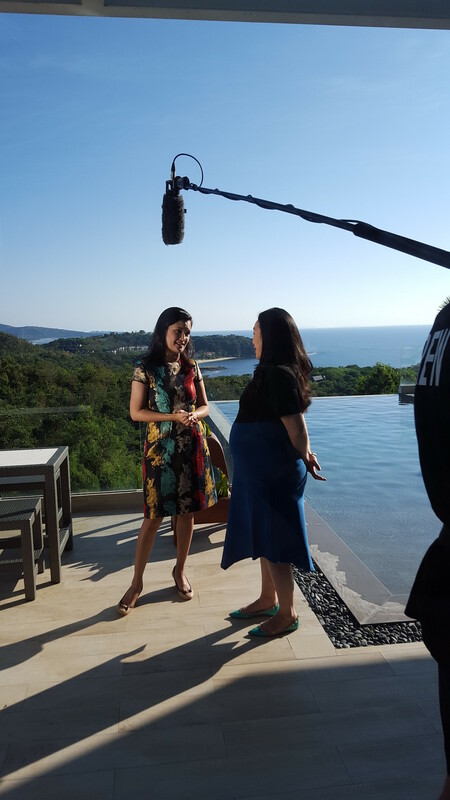 I filmed a TV special called Best Homes Philippines, produced by an Australian group that also produces “Best Homes Australia. This is yet to air in Lifestyle Network this season. 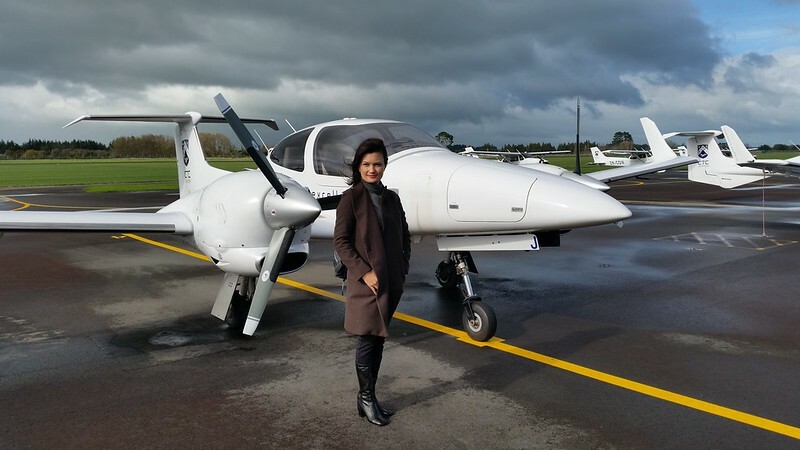 I co-hosted the show with producer of Best Homes Australia, Gary Tackle. 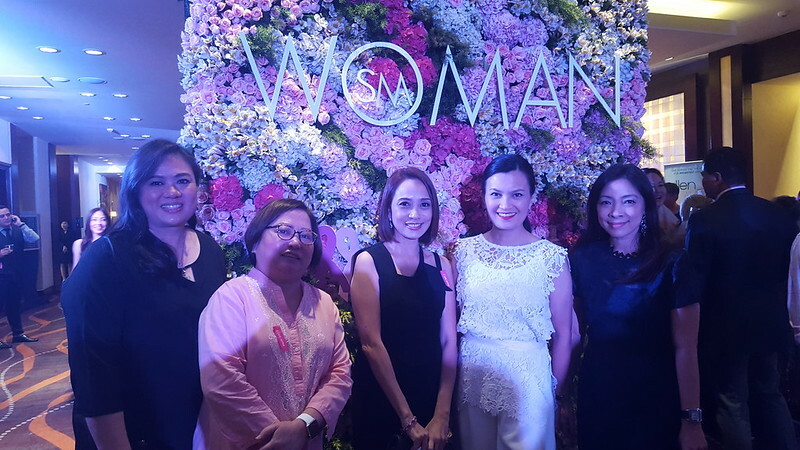 With the Belo Babies, at the dinner hosted by Belo Medical Group to inaugurate a new anti-aging machine by LPG. 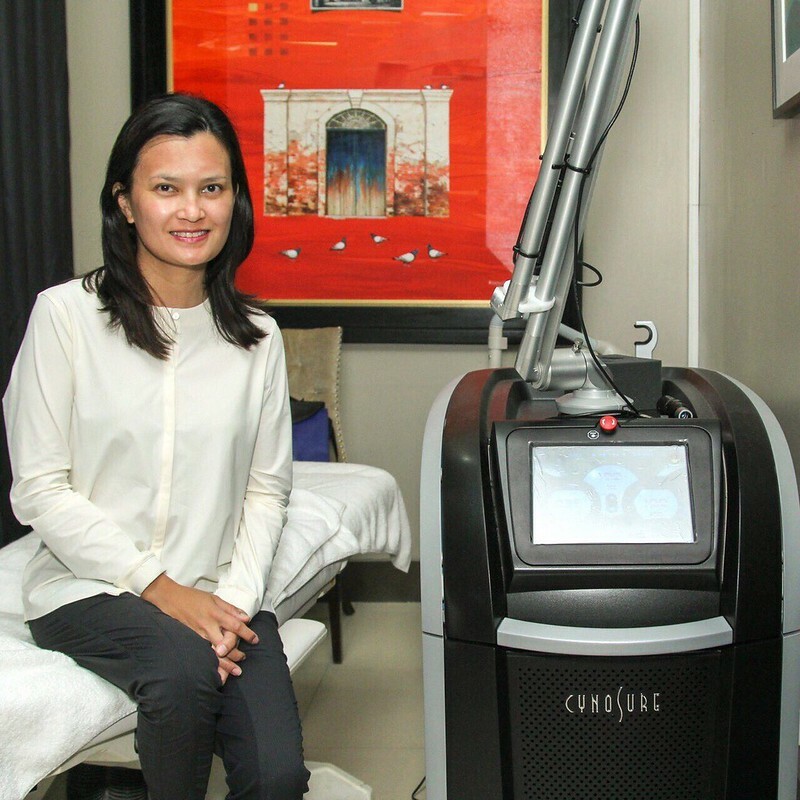 With a real life Belo Baby – Quark Henares together with Alice Dixson and Tom Rodriguez. 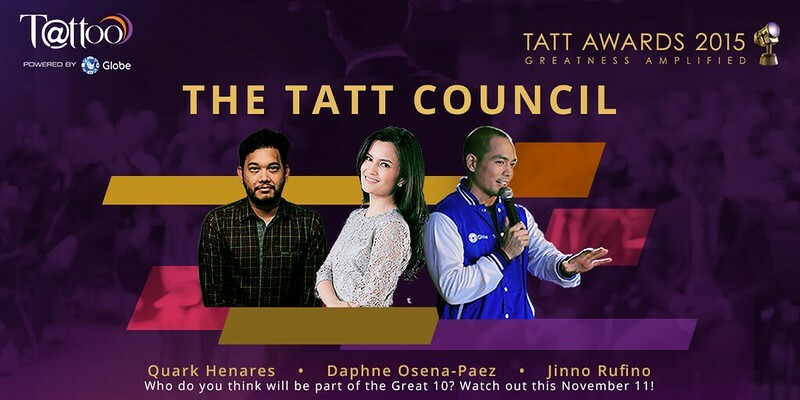 I was honoured to be part of 2015’s Tatt Council for the Globe Tatt Awards. 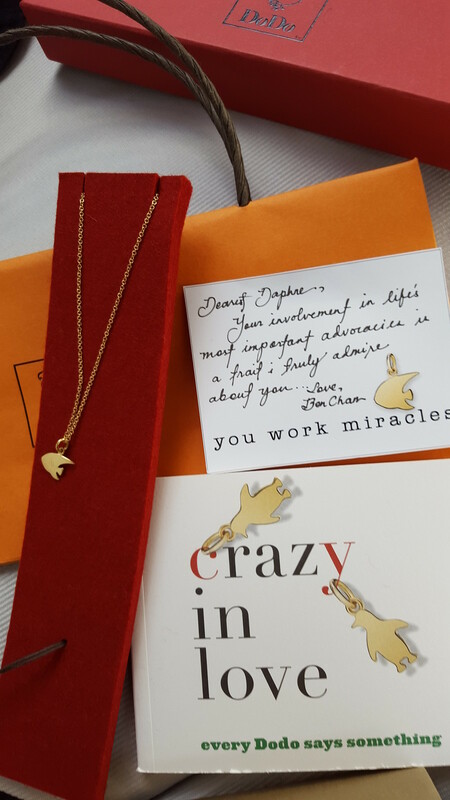 Received a lovely pendant from Dodo given by my idol Ben Chan. 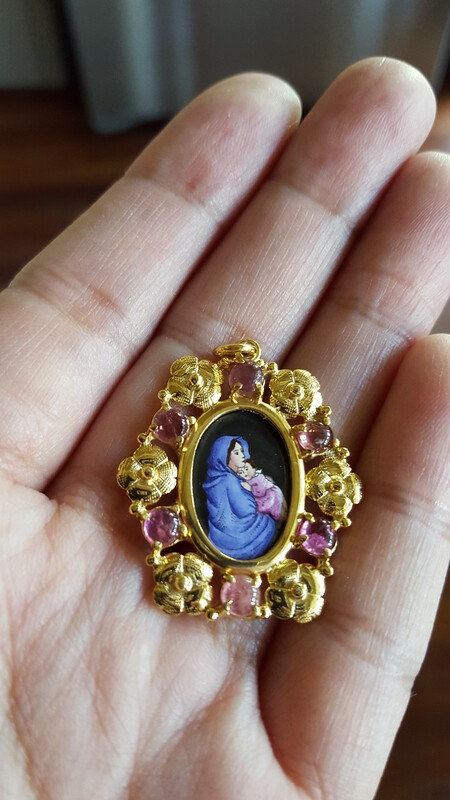 Dodo is a cute Italian jewellery brand now available in the Philippines in SM Aura. 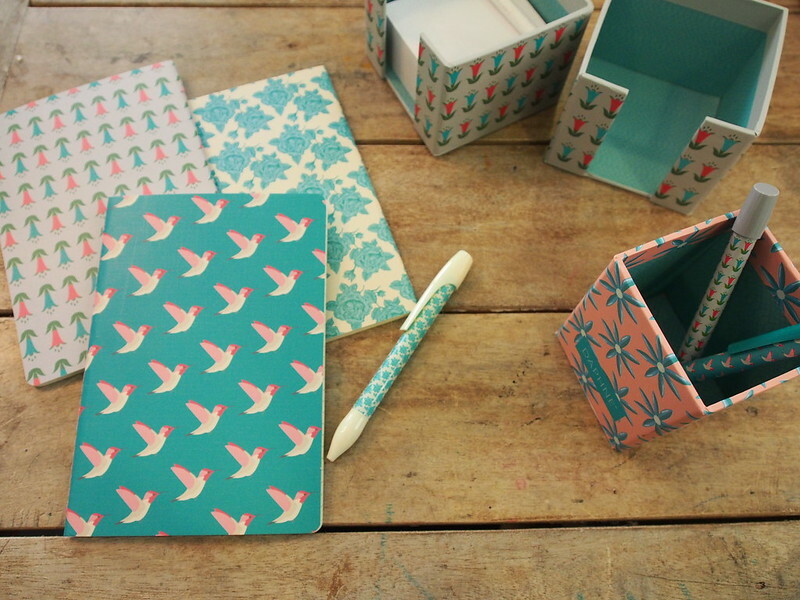 National Book Store’s Xandra Ramos Padilla brought in Itoya, a beautiful stationery brand from Japan. I renewed my contract with Melissa as their brand ambassador. Melissa is a shoe brand that my three daughters and I love to wear. My 16-month old MacBook Air crashed. I bought it in the US (in Los Altos, CA) and chose the most powerful and most sophisticated model in 2014. I was so distraught that the motherboard just died. 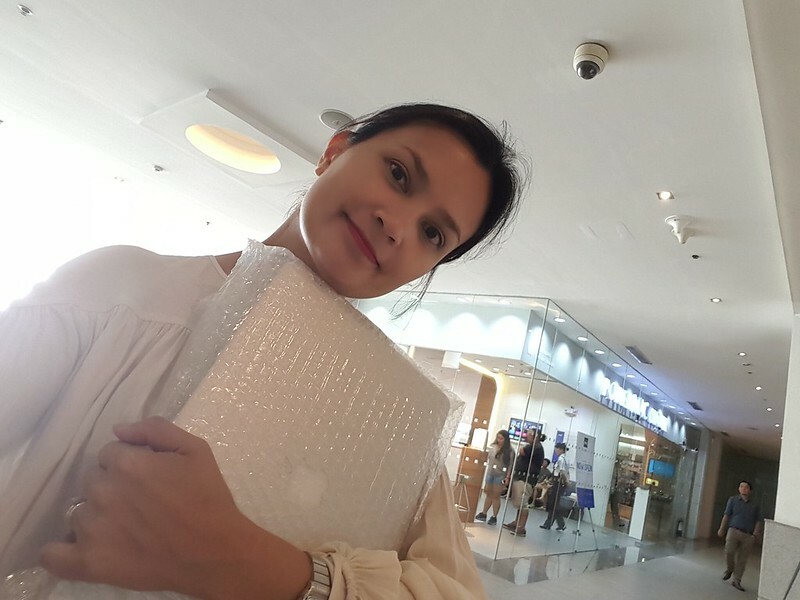 PowerMac, an authorised local reseller, said it would cost me P30,000 to replace the motherboard. I phoned 1-800 Apple Care and told them my very sad story. I didn’t have extended warranty. But they still replaced my motherboard for free. Faith restored in Apple. 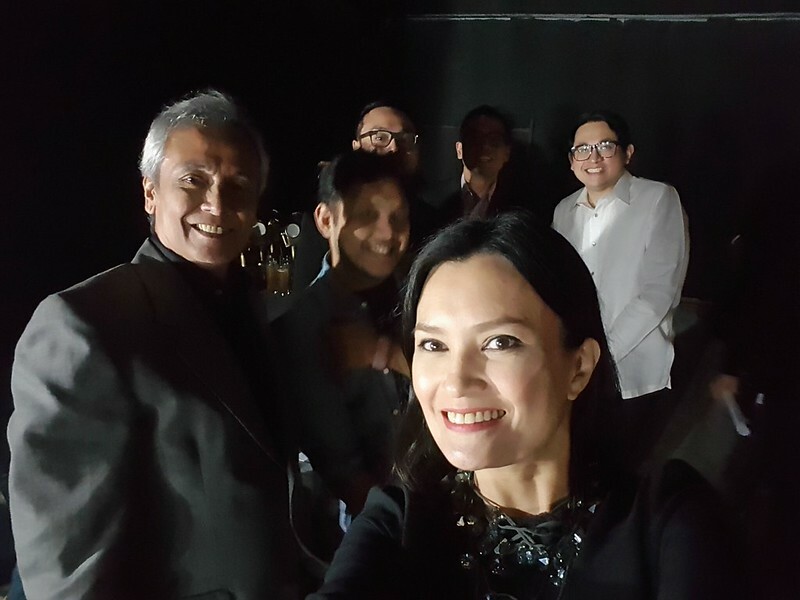 At the Tatt Awards Night backstage with fellow judges – Jim Paredes, Quark Henares, Mike Carandang, Jinno Rufino, and Sen. Bam Aquino. 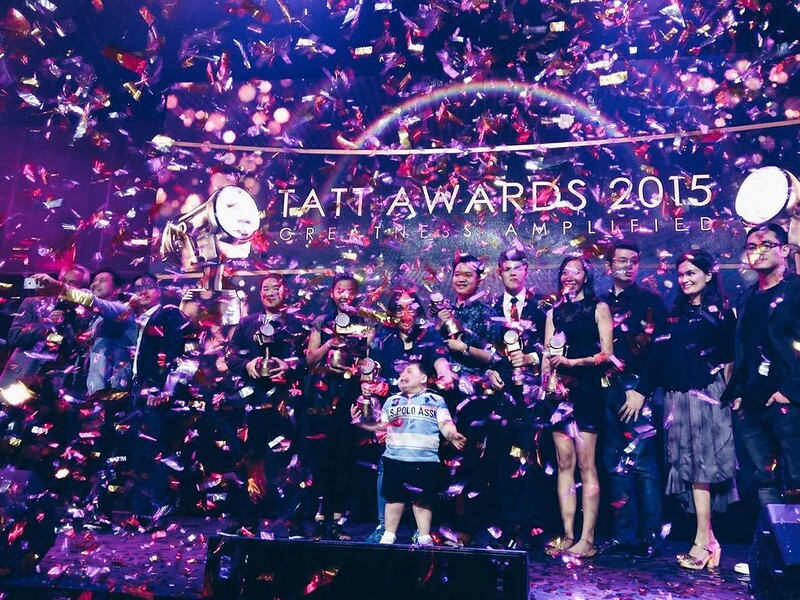 With the winners of the Tatt Awards. I visited the head office and main lab of Hi-Precision Diagnostics, my blog sponsor. Check out their list of diagnostic services including cancer screenings, food intolerance tests, and prenatal screening here. 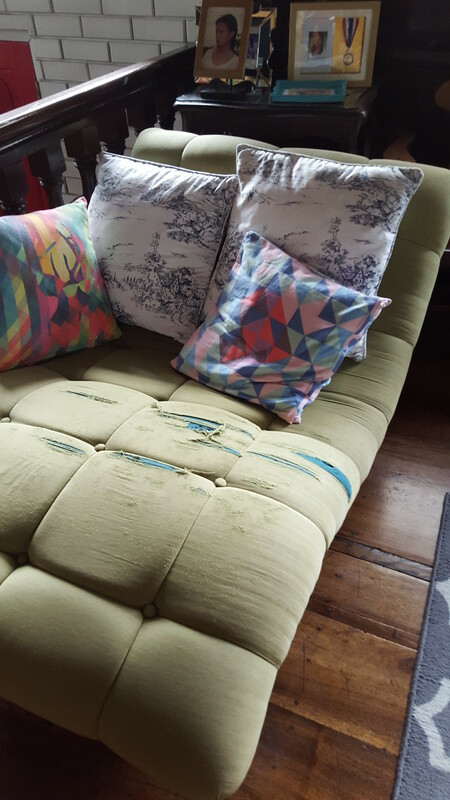 Our 10 year-old vintage lounge chair from the 60’s was due for reupholstering. 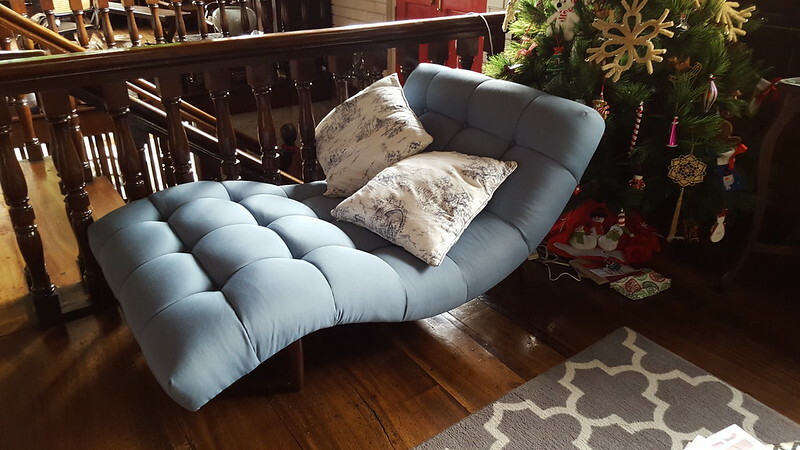 (We found this chair in a dumpsite 10+ years ago). I went for a silver blue colour. A few days after I got my couch, Pantone announced their colour of the year – rose quartz and serenity. Serenity looks like this. 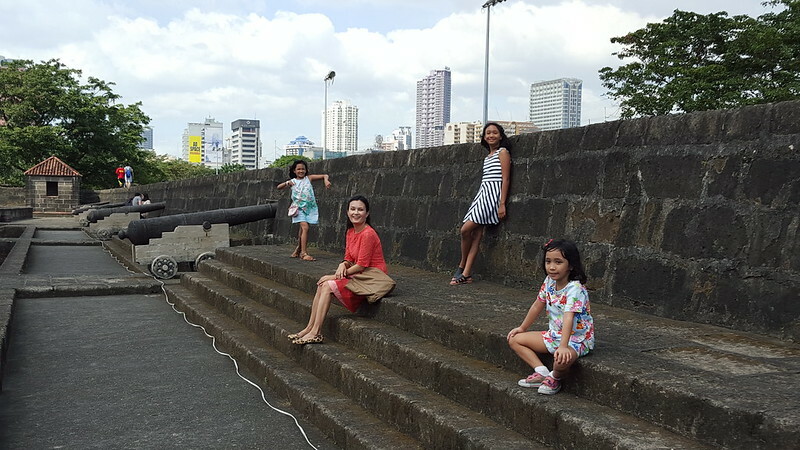 A random weekend trip to Intramuros is always a good idea. 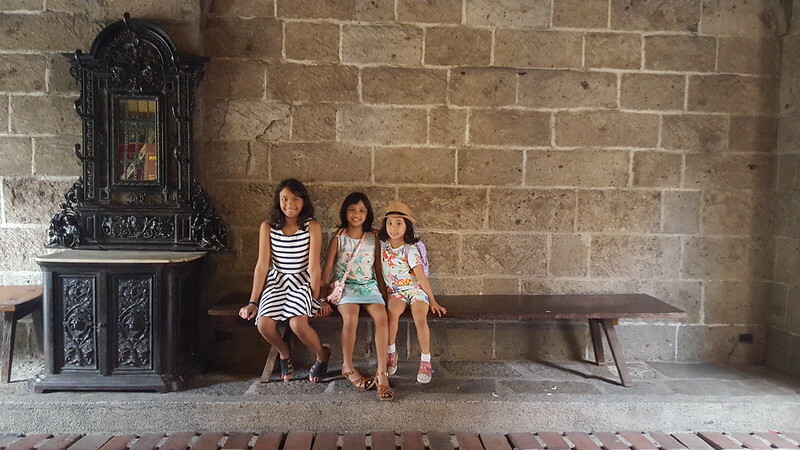 The kids love Intramuros – there’s a lot to do… walk, ride Kalesa, have merienda, walk, walk, walk. 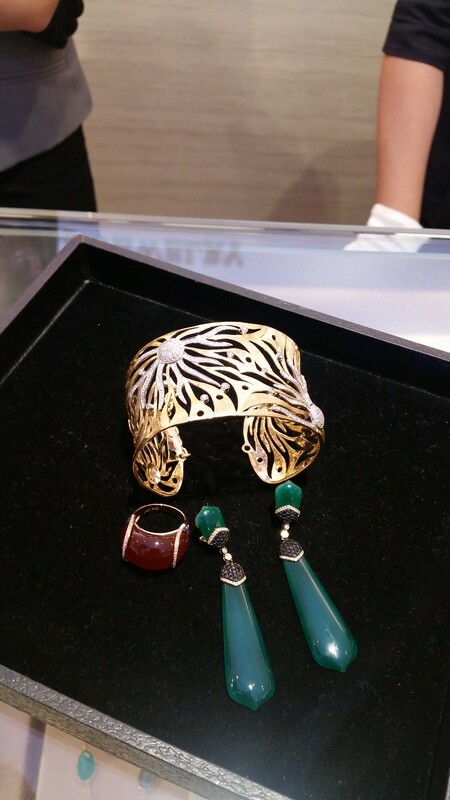 I attended the launch of my friend Mel Cuevas’ jewellery line, COVA. This was the year Lily found a true good friend. 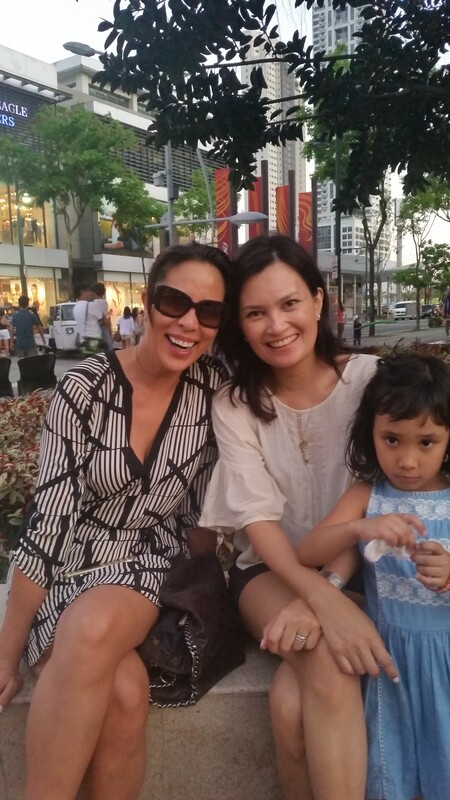 I just love it when my daughters find good friends because I also end up with new mommy friends. 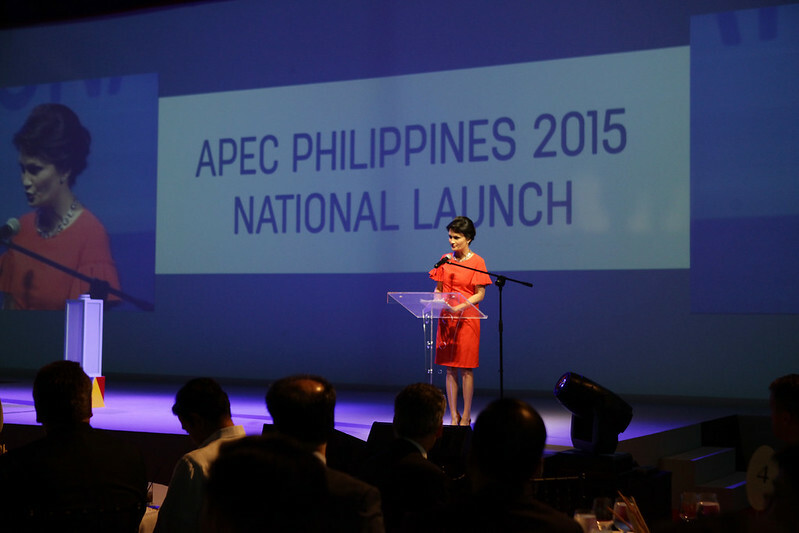 And then APEC 2015 happened. Canada’s new Prime Minister Justin Trudeau took our breath away. 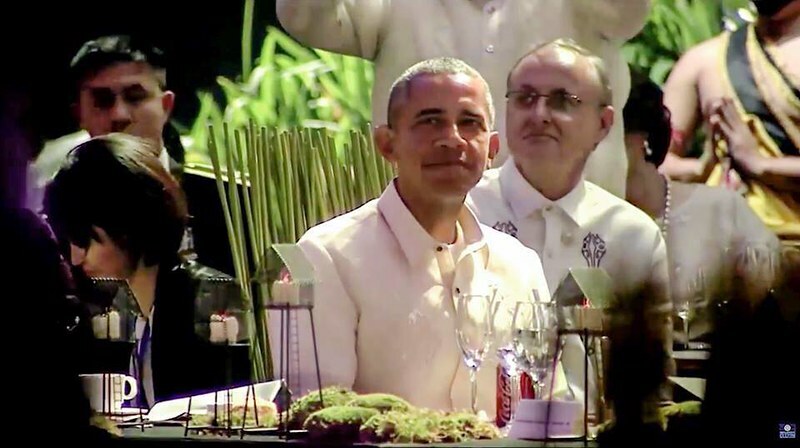 US President Barack Obama on a Kenneth Cobonpue Yoda Chair at the APEC 2015 Welcome Dinner. 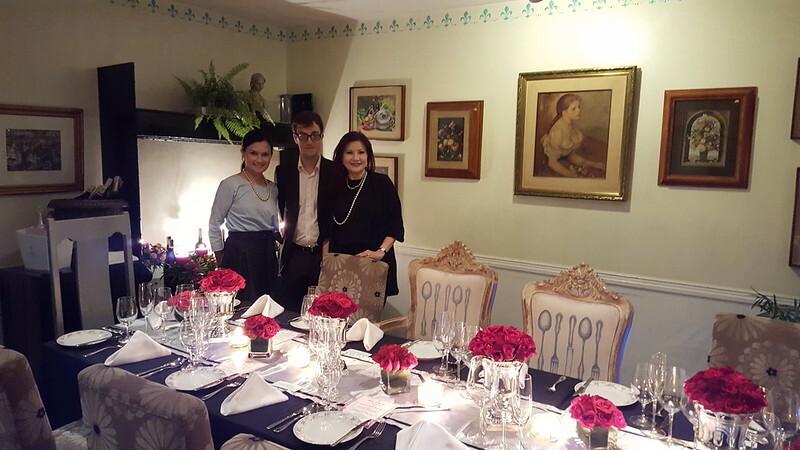 Together with the UNICEF Philippines team and Kenneth’s staff put together Auction for Action in two weeks. And this was at the height of the Christmas rush! 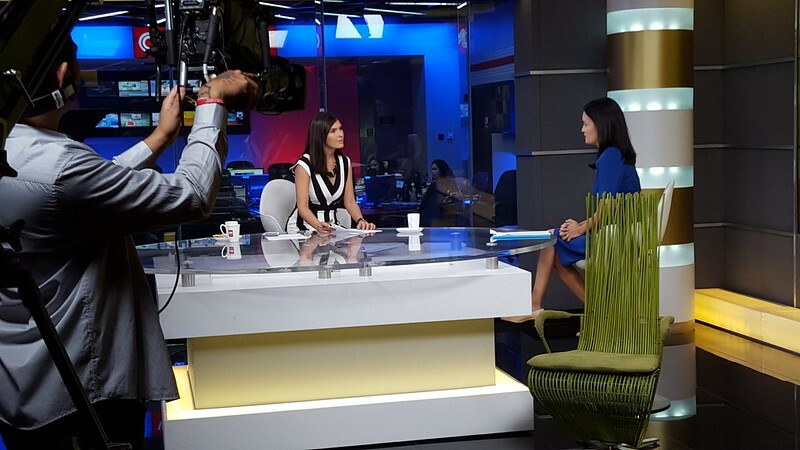 I appeared on CNN Philippines and brought with me the chair that PM Justin Trudeau sat on. The actual auction took place on December 16th. It was the most exciting 2-hours of my hosting career. I was the auctioneer and did not take a break. 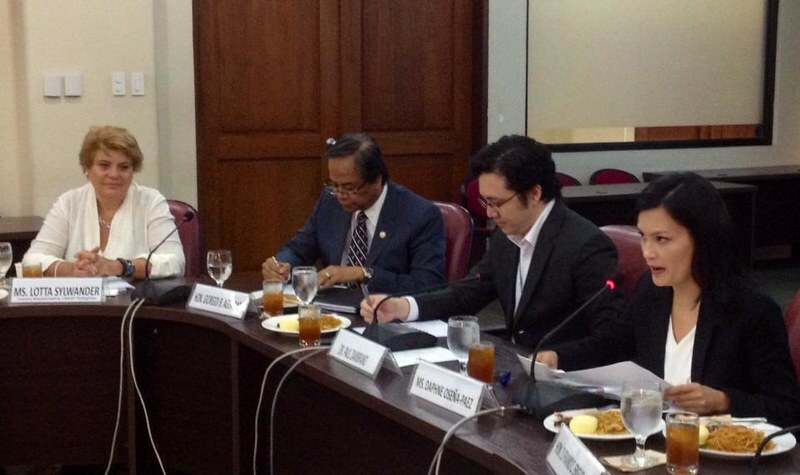 We sold all 6 APEC chairs for a total of P8.8 million. I was in shock. 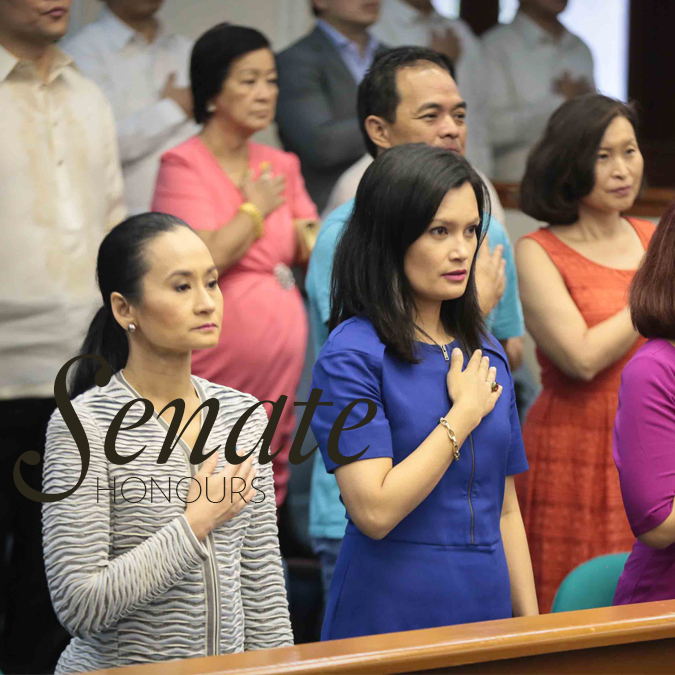 The past three Auction for Action events, I raised a total of P8.2 million. And this time, in a span of 2 hours, we raised more than what we did in three years. 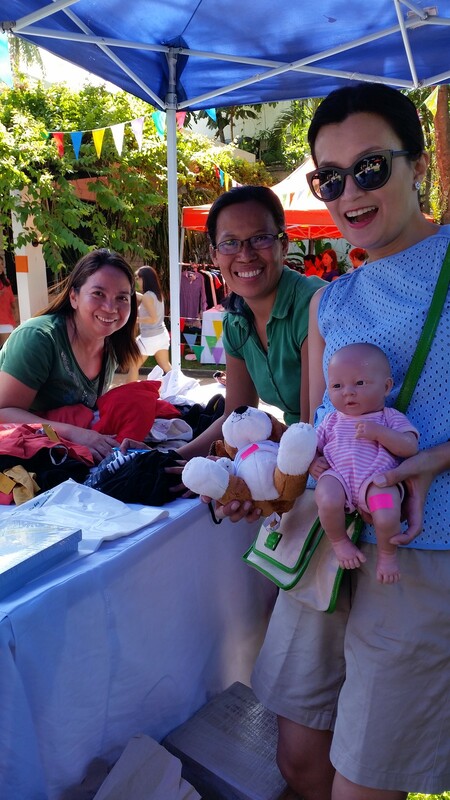 This will go along way in funding UNICEF Phililppines’ programs for the First 1000 Days. 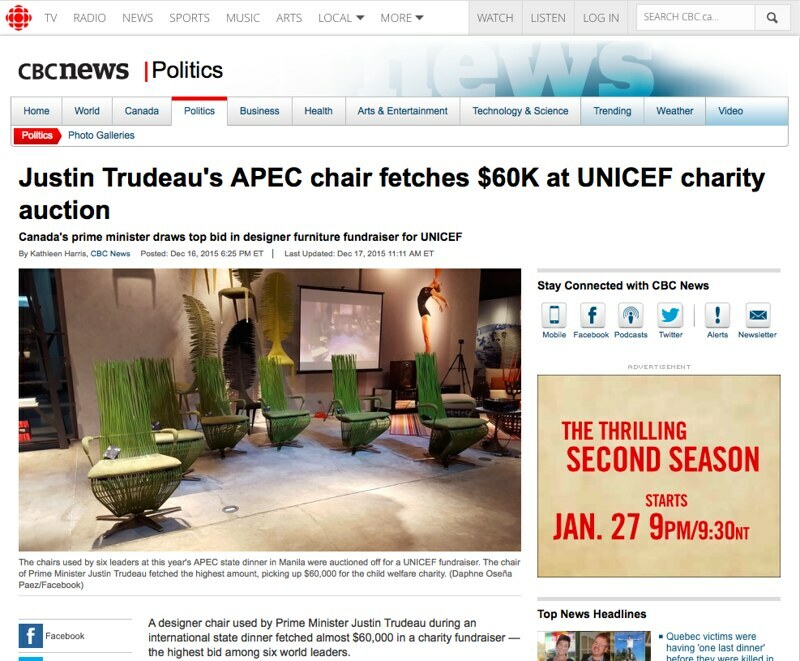 The auction made it to international news such as Huffington Post and the CBC. Read here. 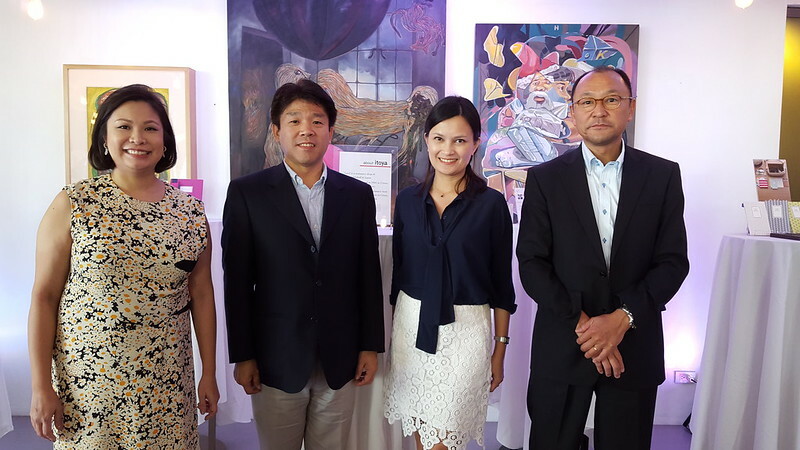 In between the UNICEF auction preview and the actual Auction for Action (1 week period), the officials of France’s Secours Populaire Francais came to the Philippines to inaugurate a high school they helped rebuild after Typhoon Haiyan’s devastation in Busuanga, Palawan. SPF was the organization that sponsored Sophia’s trip to France in August. 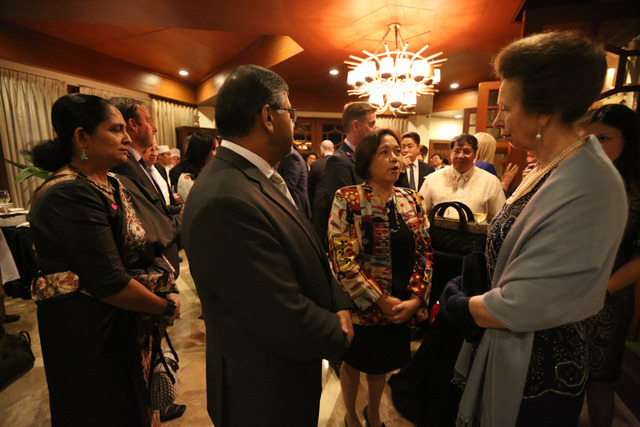 We were invited to go to Busuanga for the inauguration, but I could not attend because of my UNICEF duties. So instead I committed to help organise their dinner in Manila on Dec 13th. In this photo is SPF President Julien Laupretre and former First Lady of France, Valerie Trierweiler. 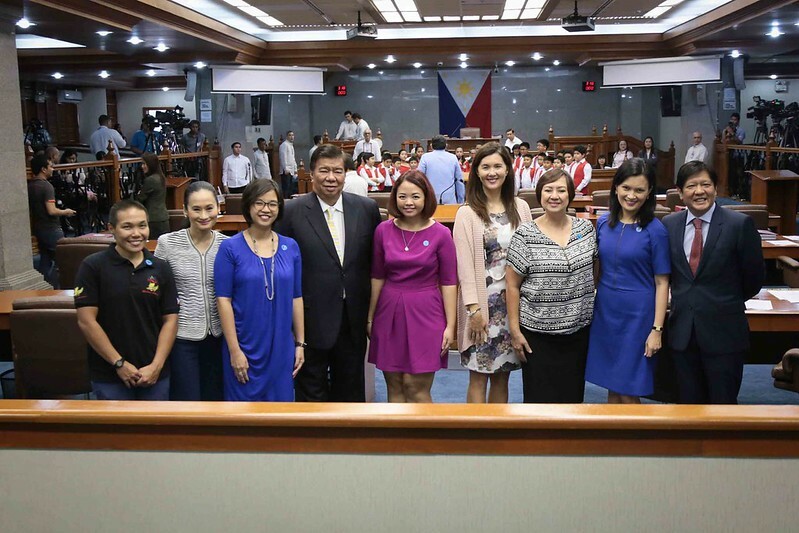 Also present was Dep Ed Secretary Armin Luistro and Mirasol Foundation’s Danny Rayos del Sol and Amy Loste. 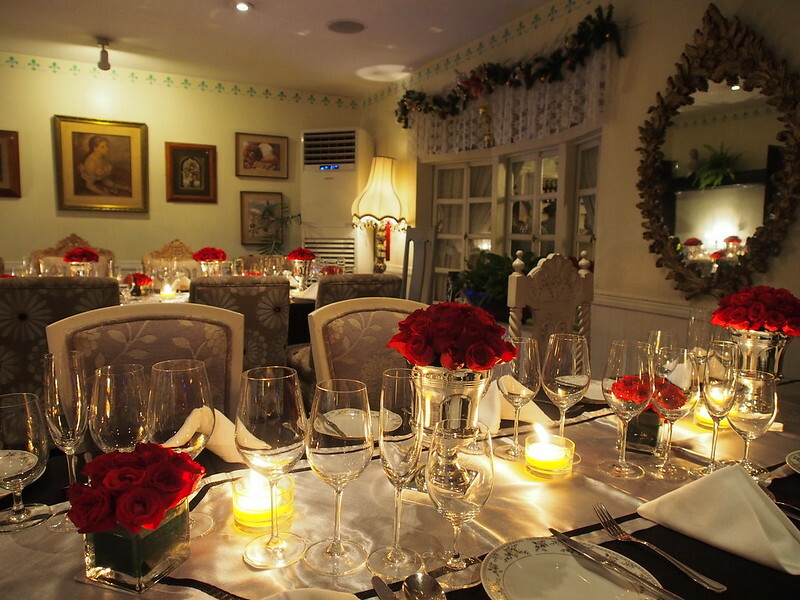 We had the most perfect dinner at Makati Garden Club. 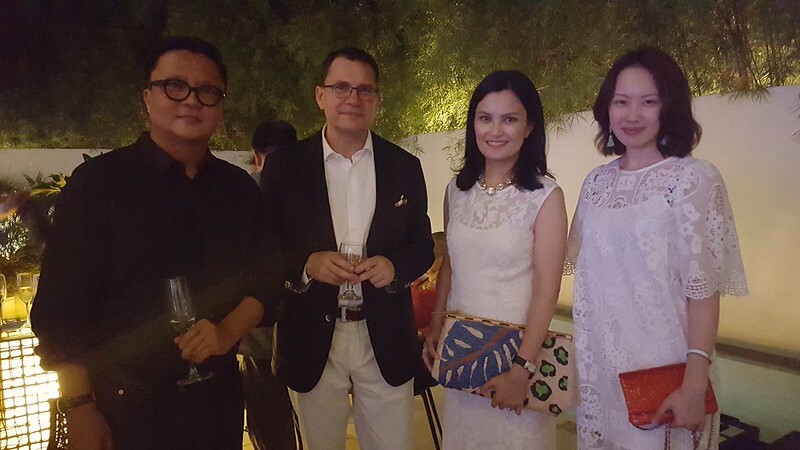 Our wines were from AWC, courtesy of Edouard Vauthier and Makati Garden Club’s Sandra Fernandez. Sophia presented Julien Laupretre, President of Secours Populaire Francais, with her artwork inspired by her experience in France last August. Also in photo is Marie Francoise Thull SPF Moselle President. 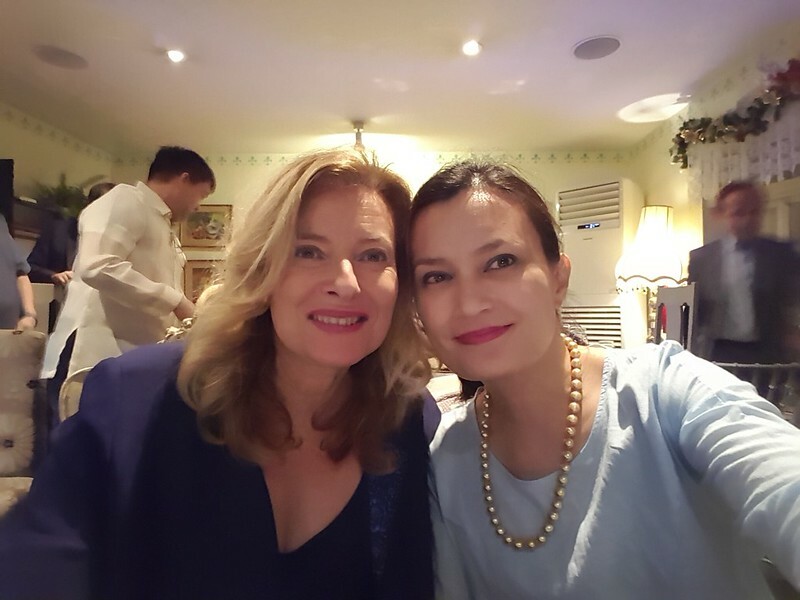 A selfie with Valerie Trierweiler. (She was the former partner of France’s President Hollande). Well this has been the longest blog entry I’ve posted maybe. Or at least photo-wise, it’s very long. I can’t thank you enough for still being here. 2015 was a year when I didn’t make any specific plans for work or the family. Yet looking back, I realize that everything just unfolded at the right time and the right place. 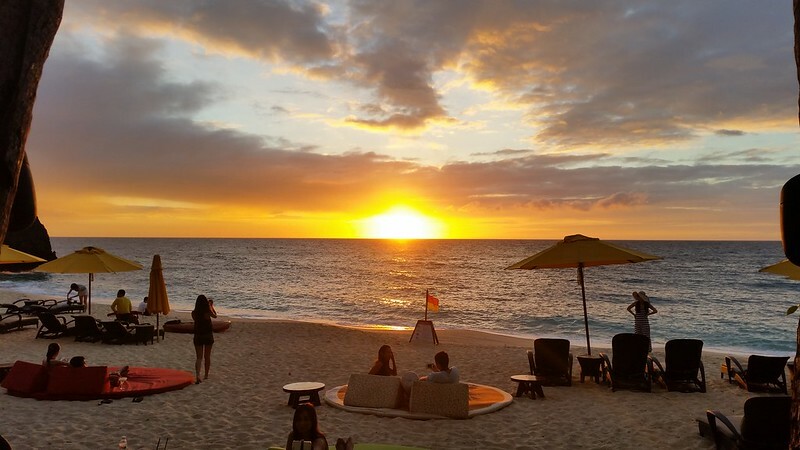 2016 may not be as relaxed or carefree. I have a few projects that I’m working on now, and I have real deadlines. But I will continue to just let God surprise me. Hopefully it involves lots of travel. Have a great 2016 everyone! I love your gold clogs Ms. Daphne. It fit in almost all of your clothes! Mind to share what brand it is? I hope you have a blessed year too. It was indeed a long read but nice set of photos. I do hope to see the TV show about the best houses / homes. And if I must say, I miss urban zone too. Any chance someone can bring it back on TV? I was smiling while reading everything. You’re such a wonderful woman and mother. Big love from Sydney, Australia ?? Awww, thank you!!! Really. Thank you. Bhutan and New Zealand are two of my dream destinations. 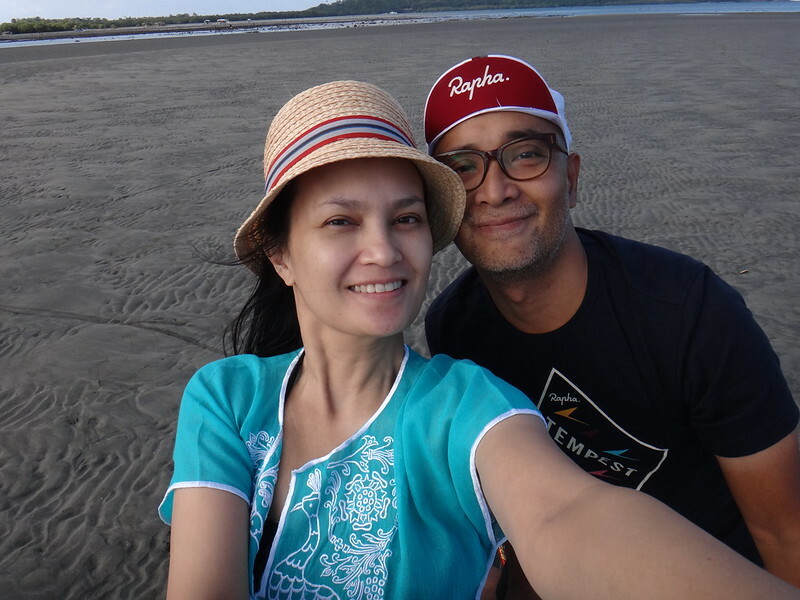 Going on ‘kid-free’ adventures with my husband is something I truly miss. You and Patrick are so fortunate to have reached that stage where you can travel, just the two of you. It seems like light years away for us. I try to be patient and remind myself that our children are so little for only such a short time. All the best to you in 2016, Daphne! 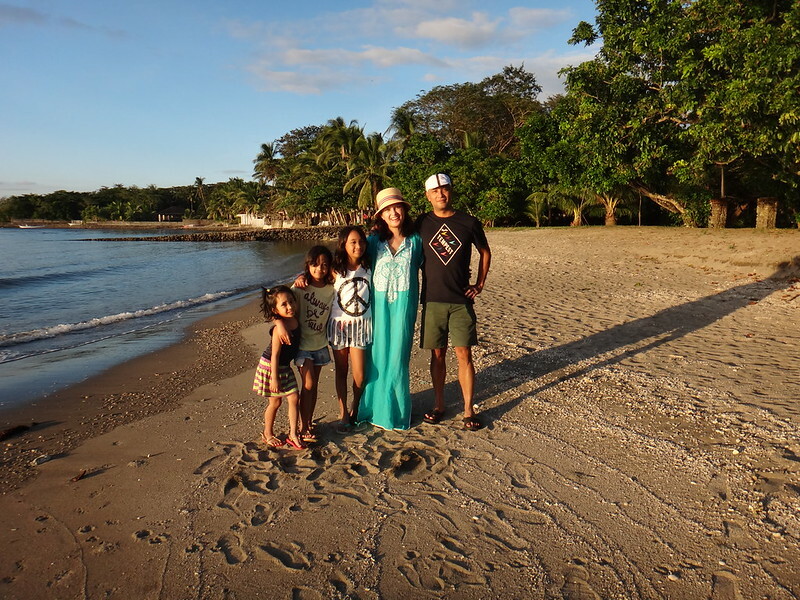 Im a big believer in JUNK (just us, no kids) traveling. But the reality is we can only do that if my parents are with us to watch the kids. So credit goes to my folks for watching our kids for us. Thanks for still being here Deepa! I hope all is well in Amsterdam. Your girl must be so big now. 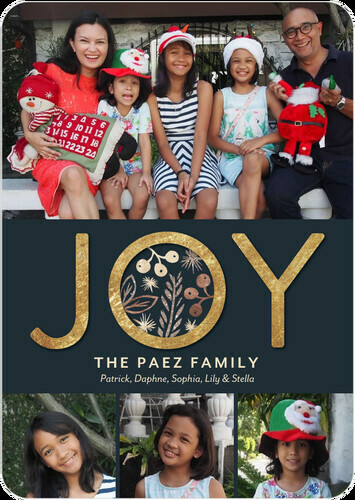 You had a great 2015! 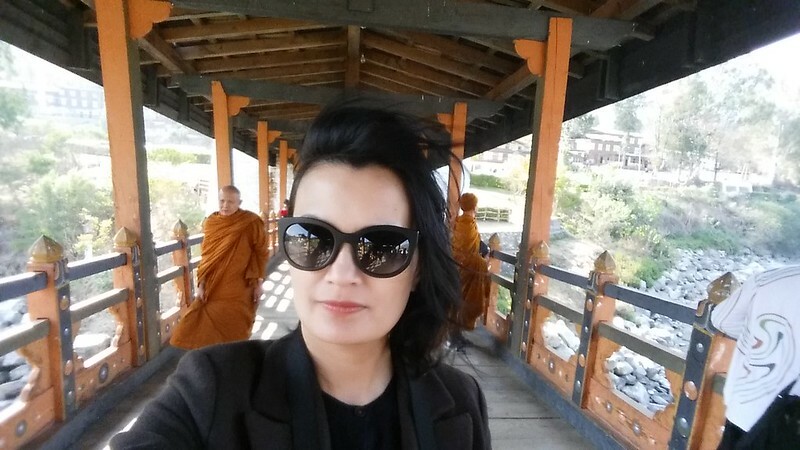 My favourite highlight was your trip from Bhutan. I need to save up for that now. Thank you. Have a great year. Thank you for sharing your lovely year! Wishing you all the best in this new year! I just have to say, I love the way your daughters dress and the activities they are into. Very age-appropriate and charming. Also, I love K&Co., and I think you perfectly embody their style and products (I’ve bought dresses from them, thanks to your posts). That was such a fun night!! And it was such a pleasure meeting you. Thank you again Cherry. I had almost forgotten about this. So honoured. Marge!!! Everything happened so fast. I want to relive it all over again. Thank you to all of you in UNICEF. Let’s do more!!! There’s still so much more to do.